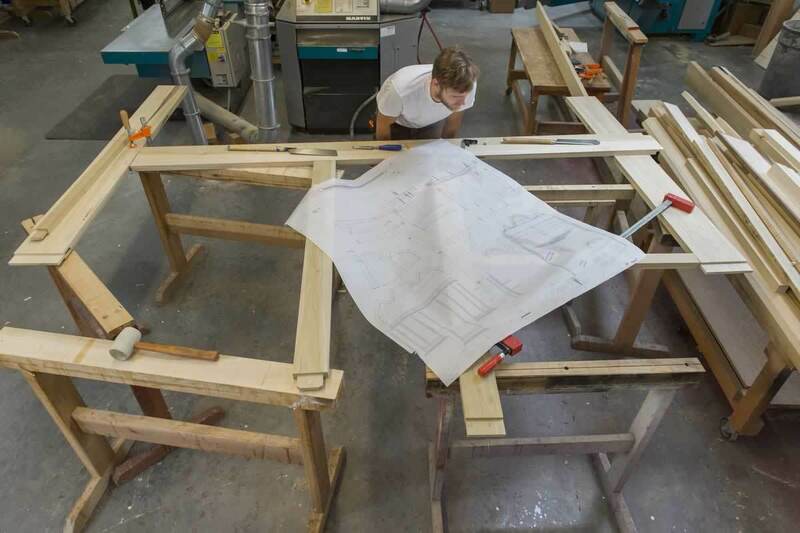 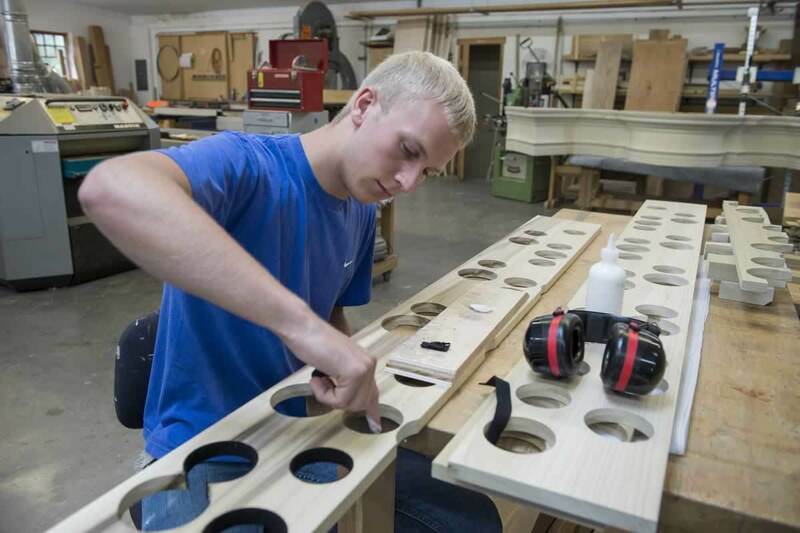 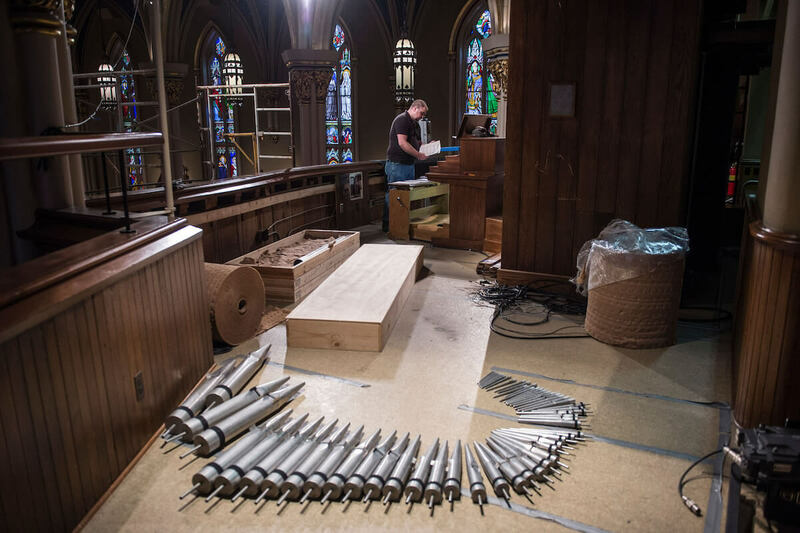 Following the genesis of a handcrafted pipe organ for the Basilica of the Sacred Heart. 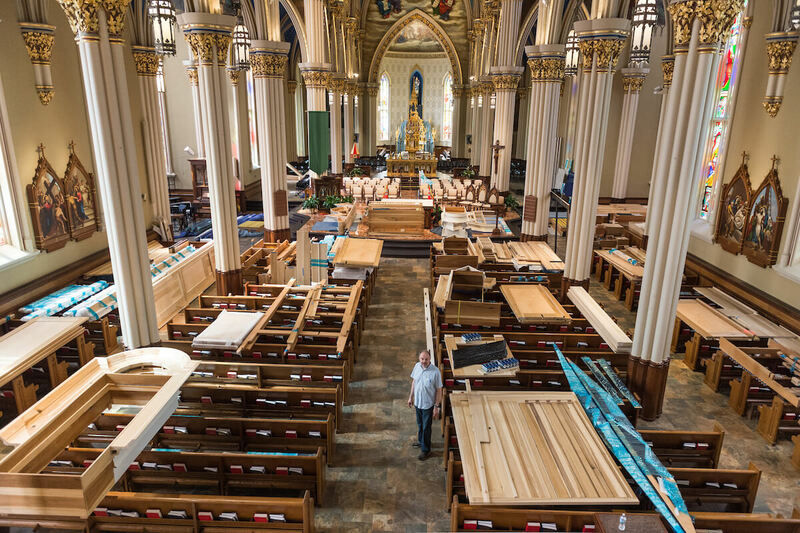 That was the vision laid out before Paul Fritts & Company Organ Builders, the Tacoma, Washington, workshop that created a unique, handmade pipe organ for the Basilica of the Sacred Heart. 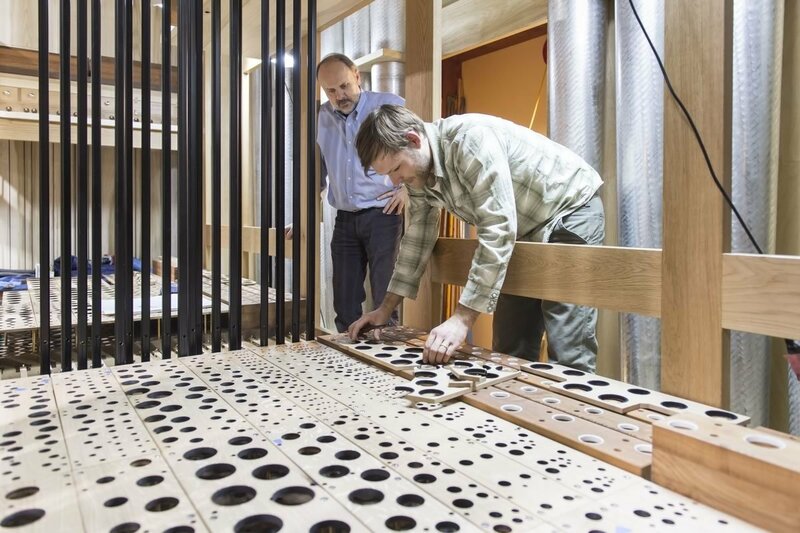 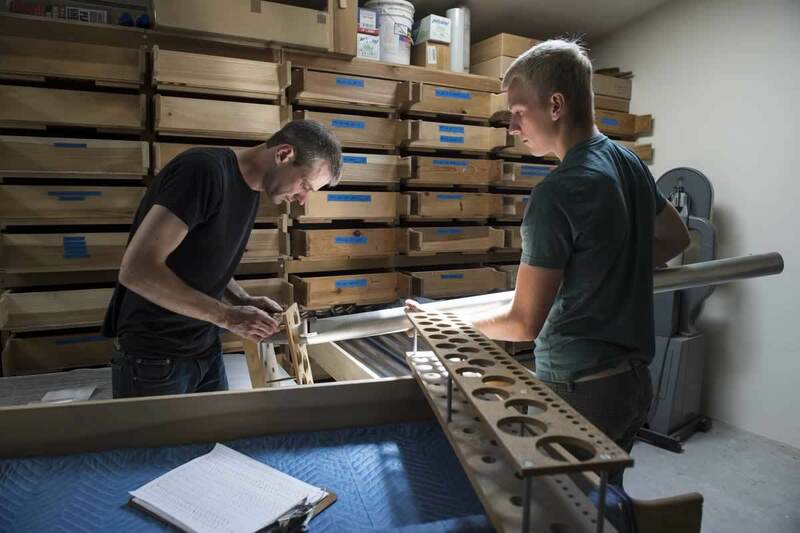 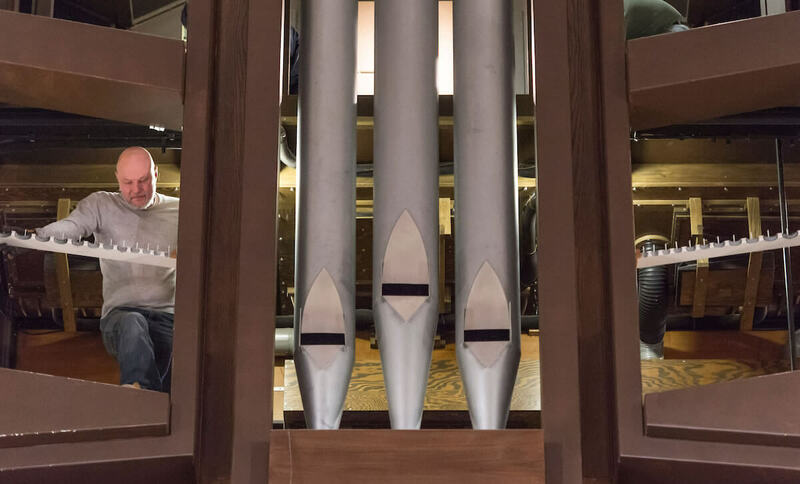 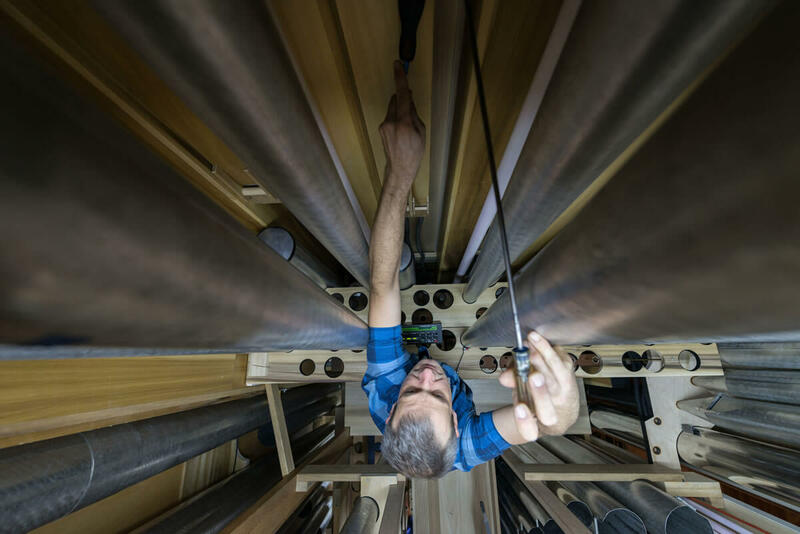 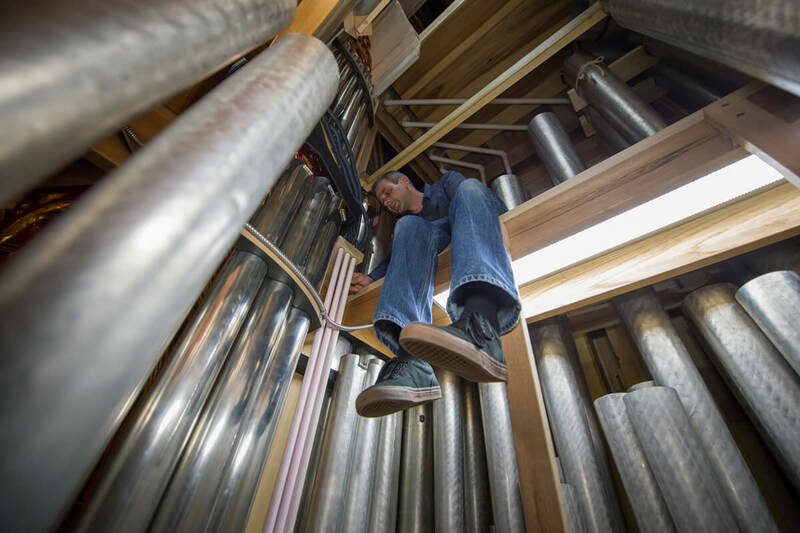 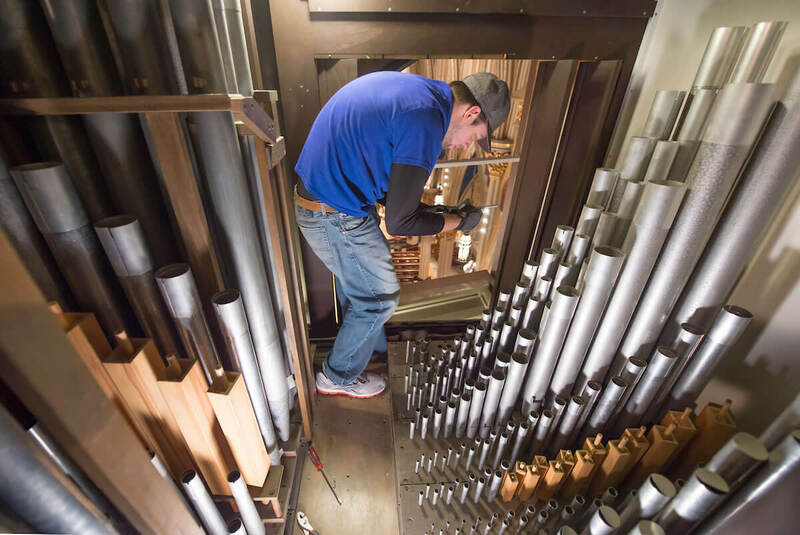 Representing four years of dedicated labor, the Murdy Family Organ will be the 36-year-old studio’s most ambitious piece for any client. 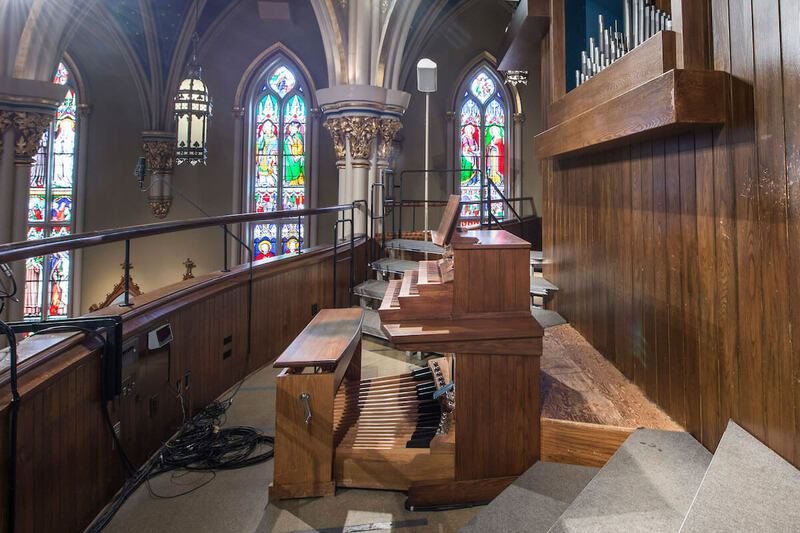 Visitors to the University’s historic church may now hear an instrument capable of leading congregational singing with unprecedented power and beauty and of training 21st century masters in composition and performance. 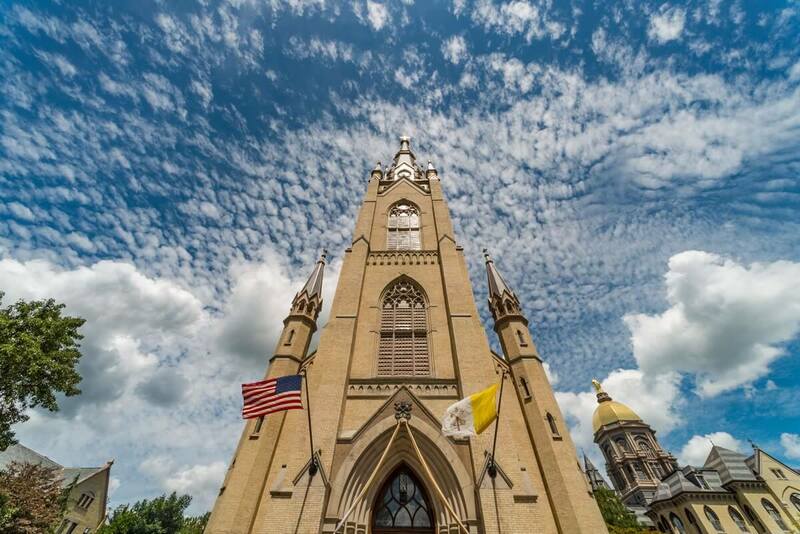 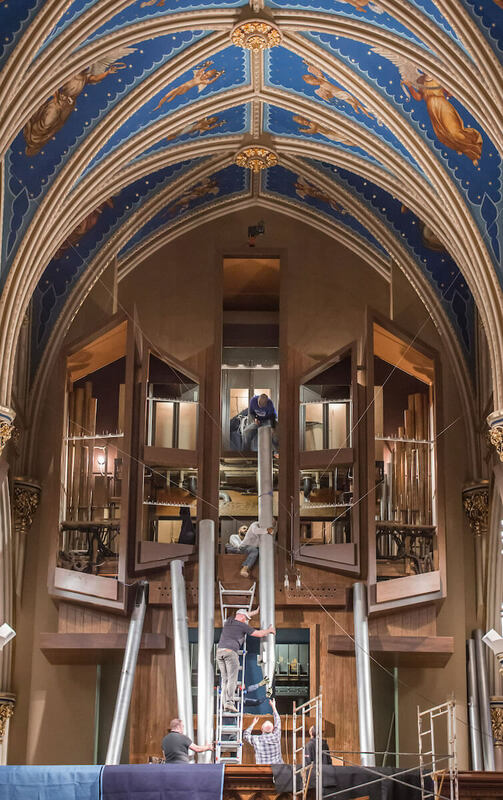 Notre Dame Magazine reports here on its creation. 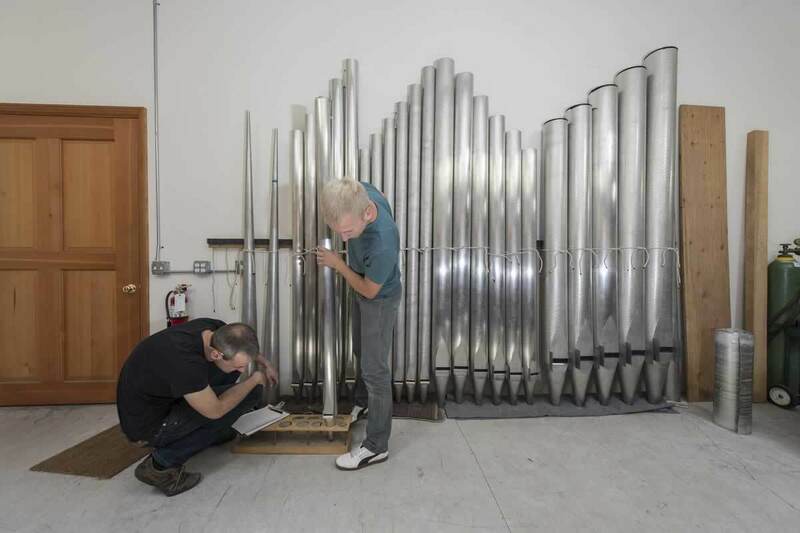 They do not all know how to play the organ. 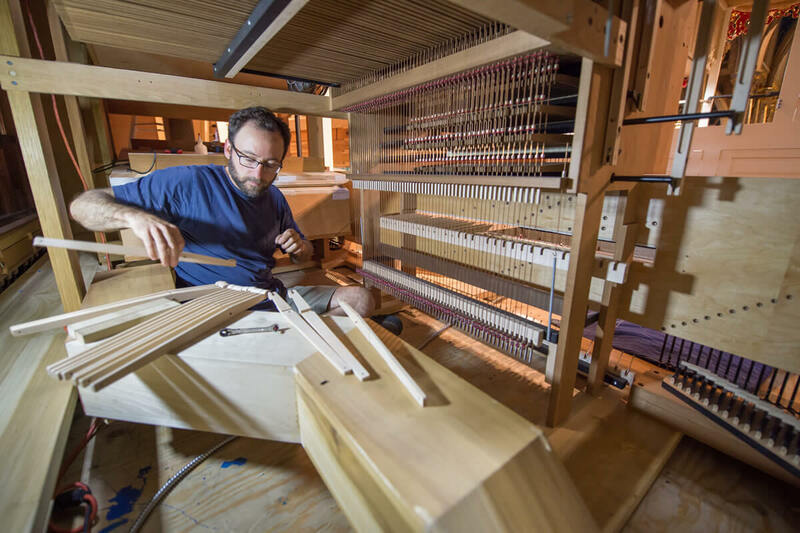 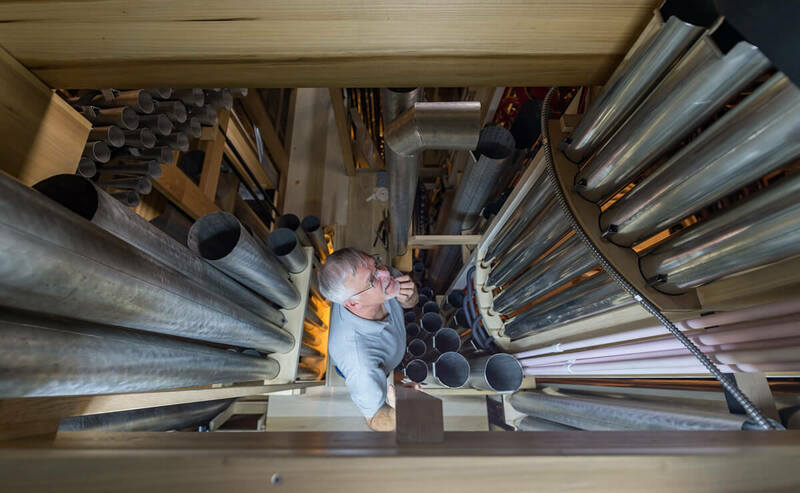 What they share instead is a devotion to the materials, skills, craftsmanship and long hours of traditional organ building and the creation of beauty that will touch the hearts of generations yet to be born. 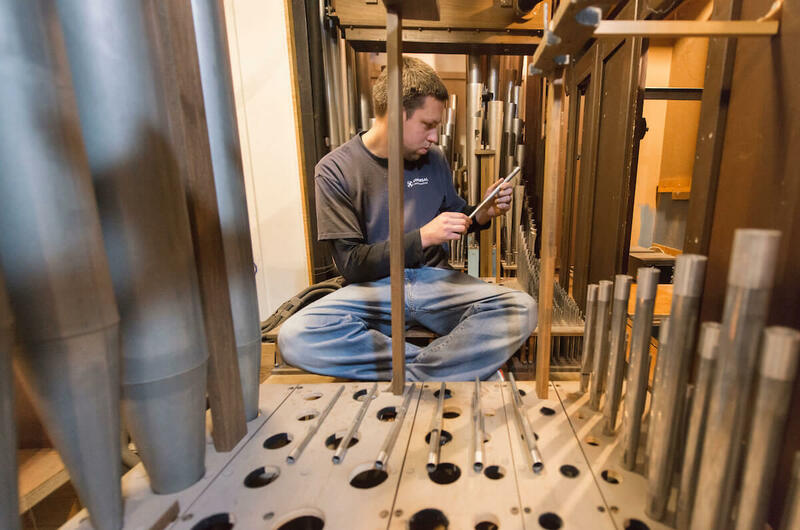 A look at the Murdy Family Organ under construction at the Paul Fritts & Company Organ Builders’ workshop. 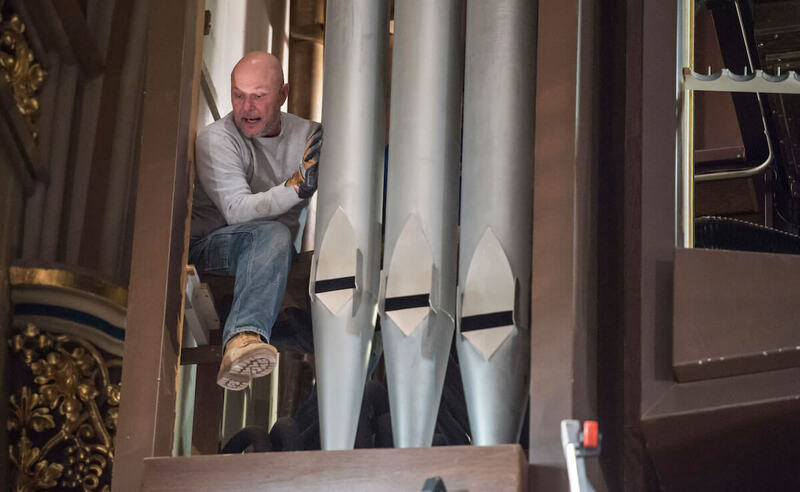 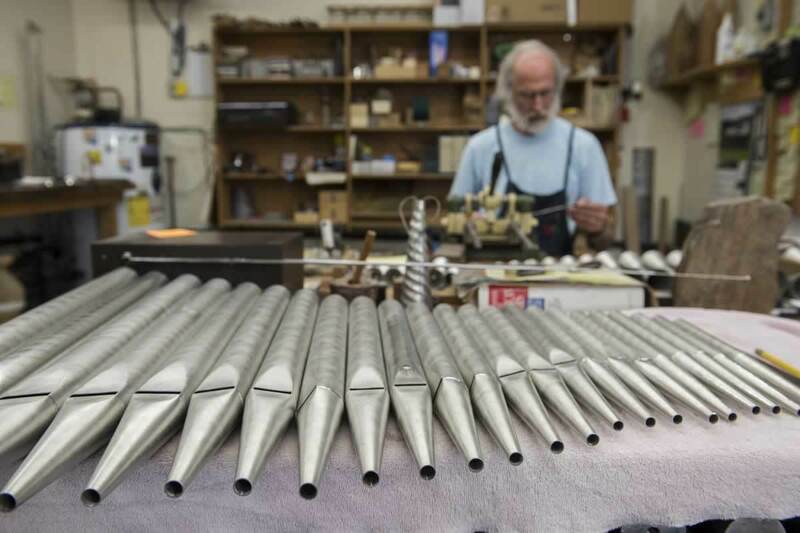 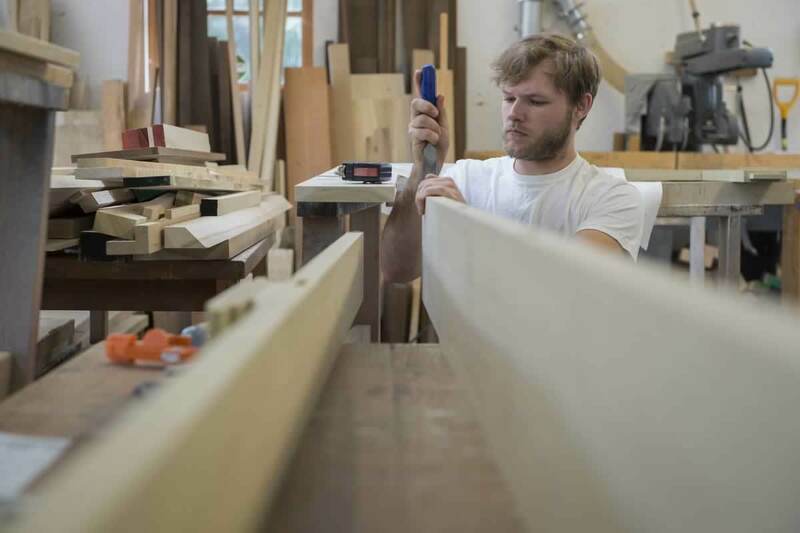 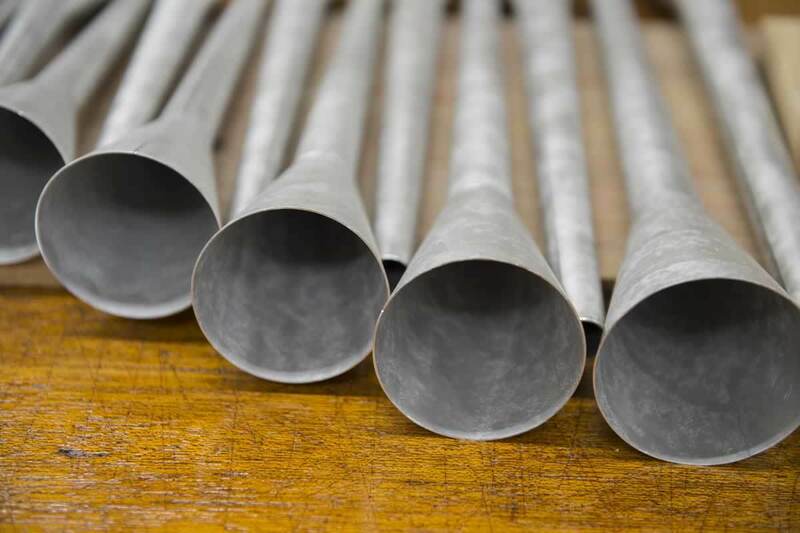 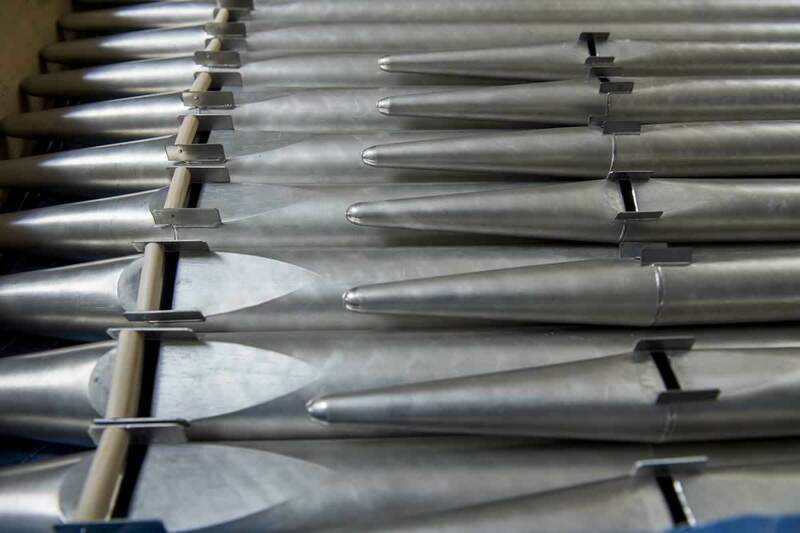 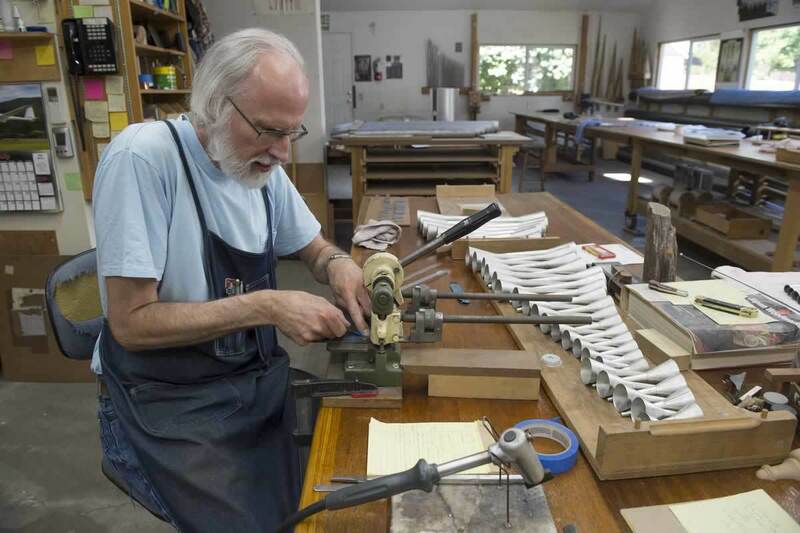 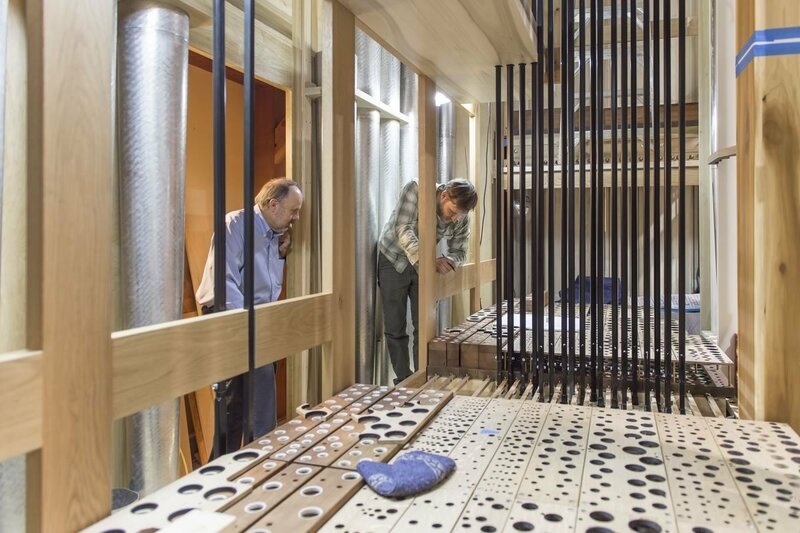 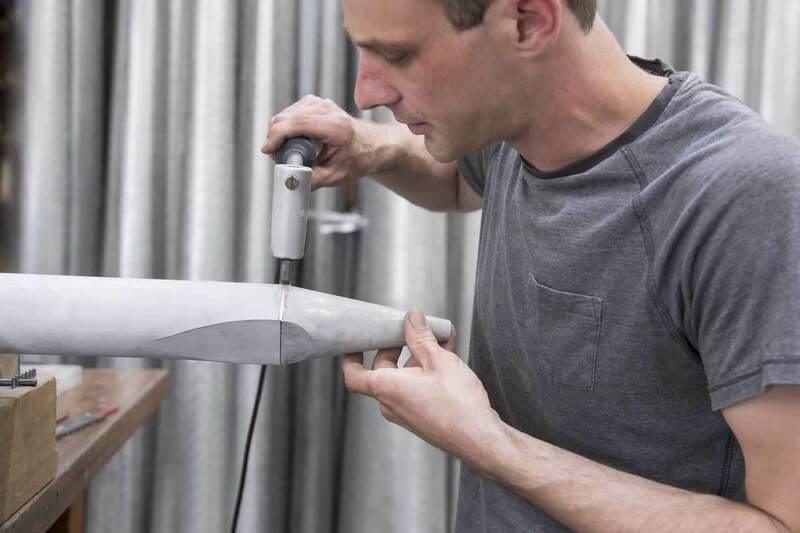 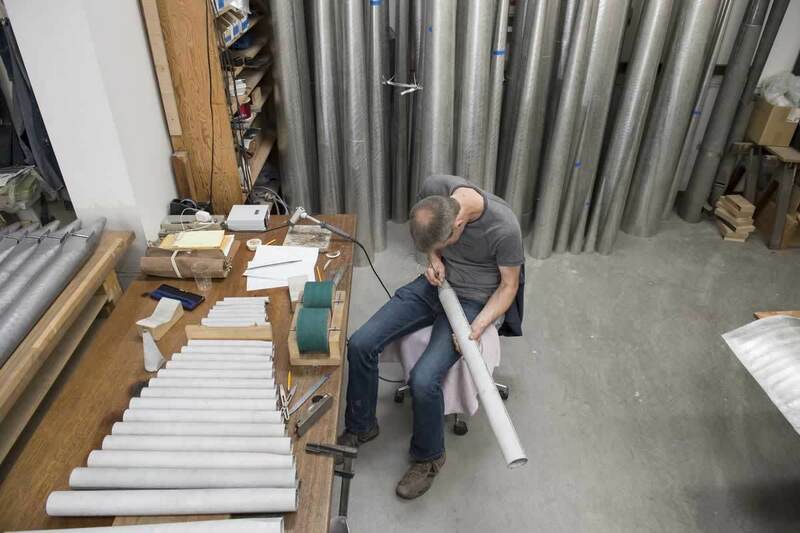 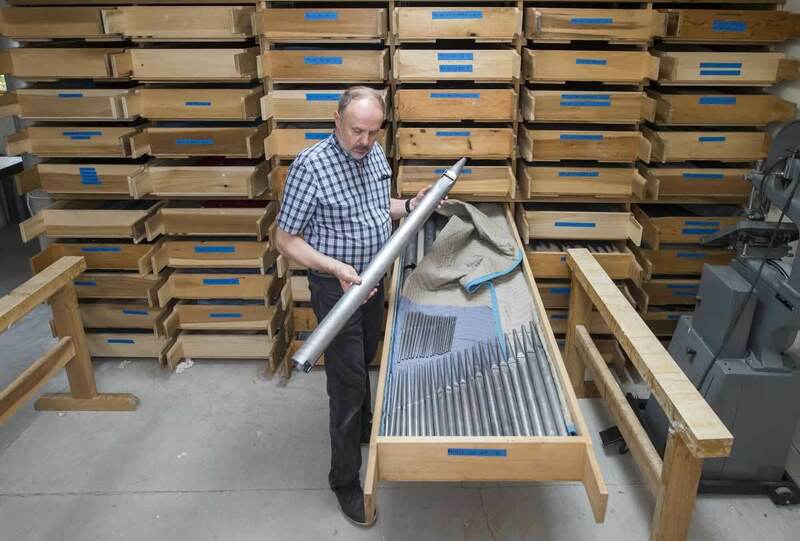 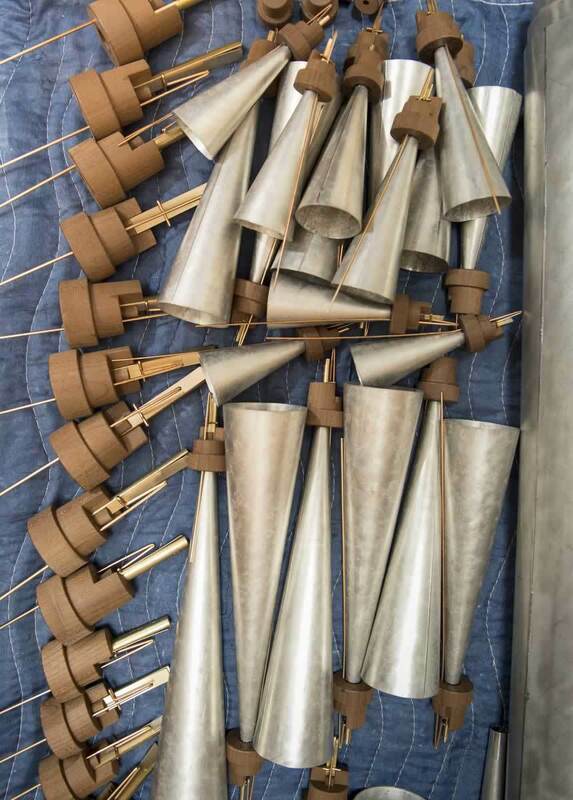 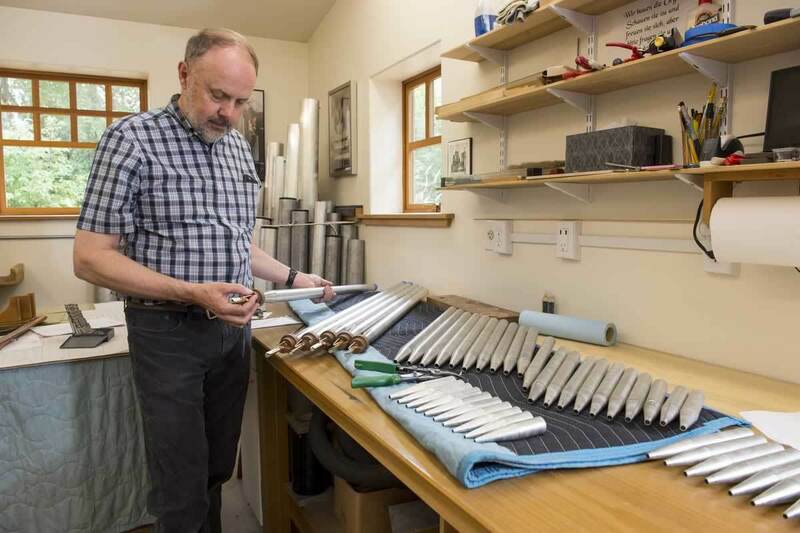 Learn step-by-step about the Fritts’ workshop’s unique method of making organ pipes. 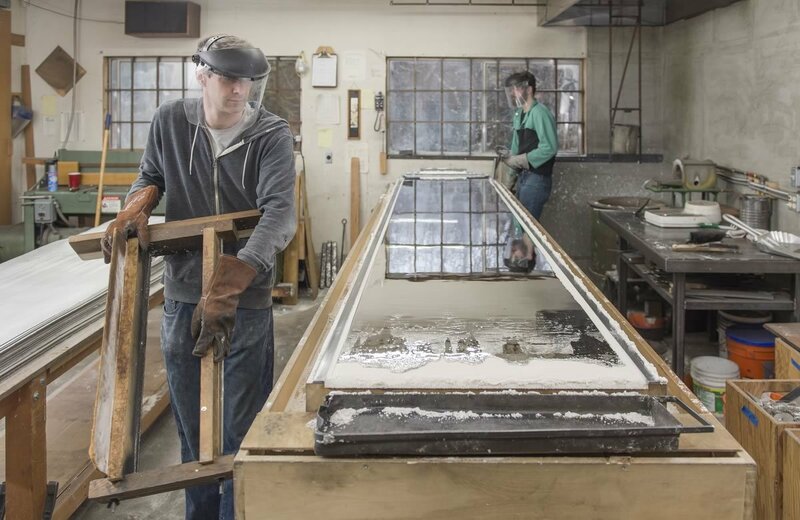 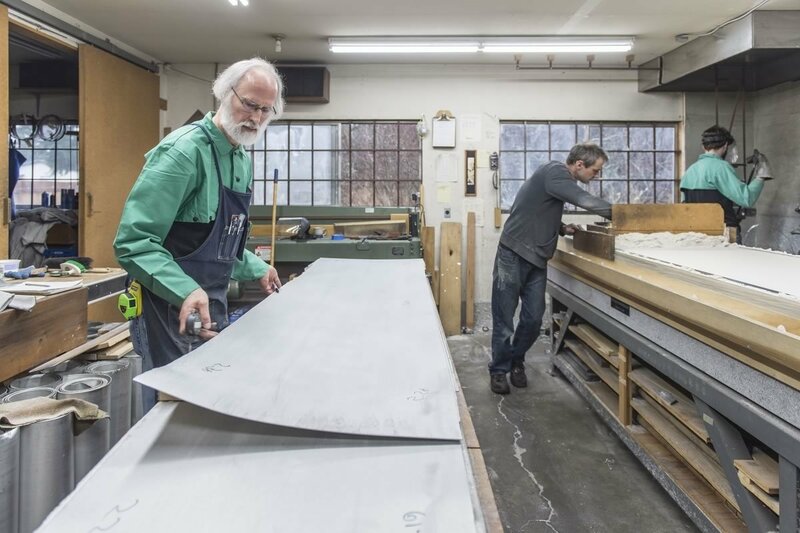 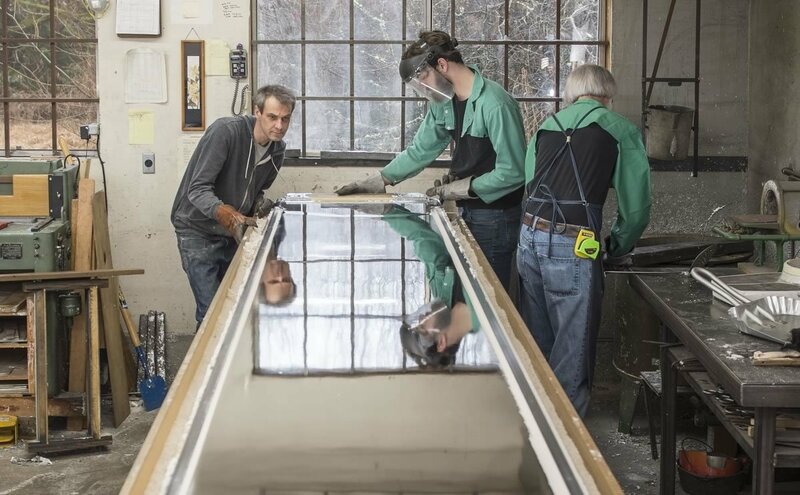 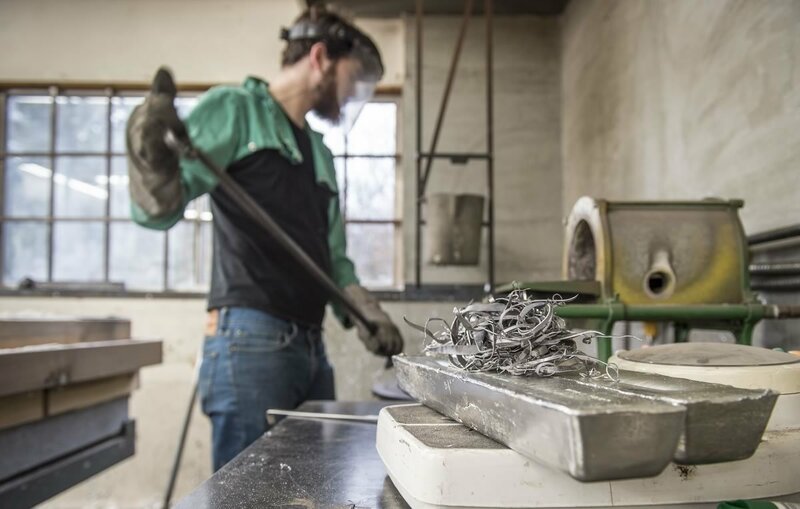 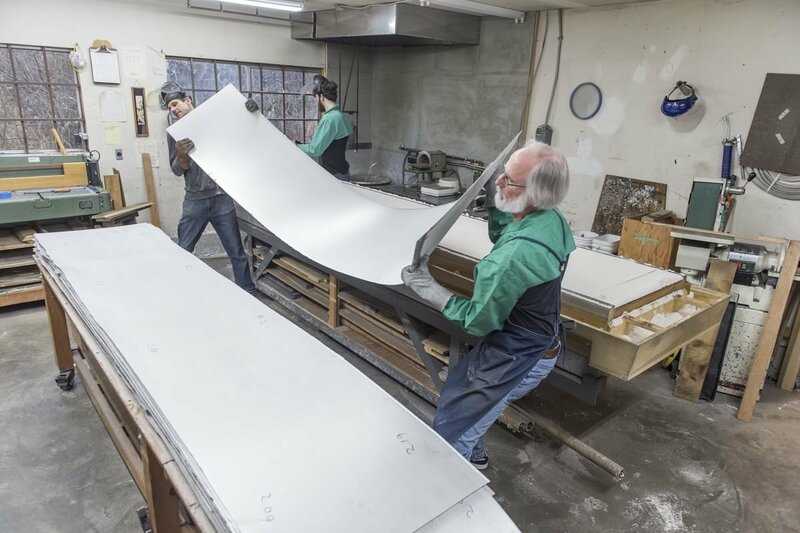 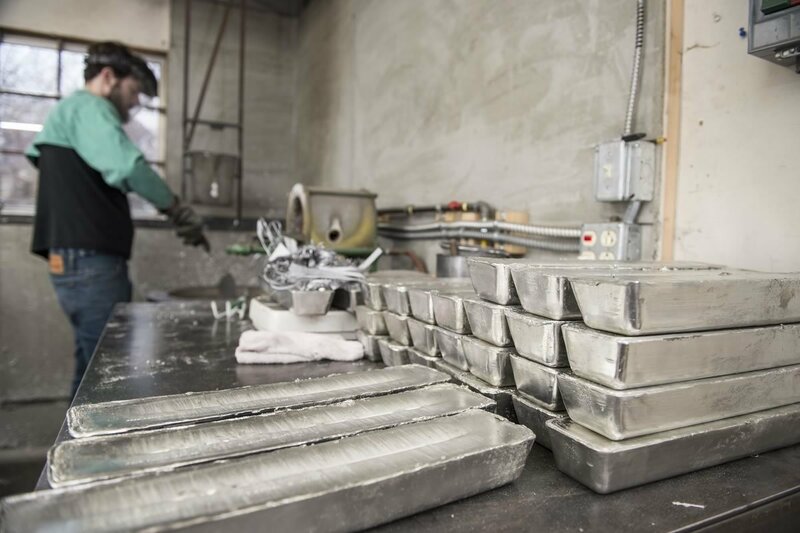 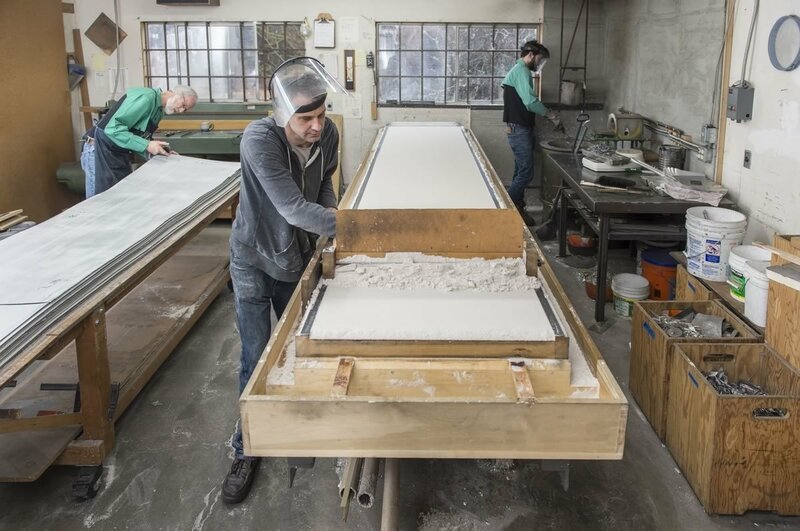 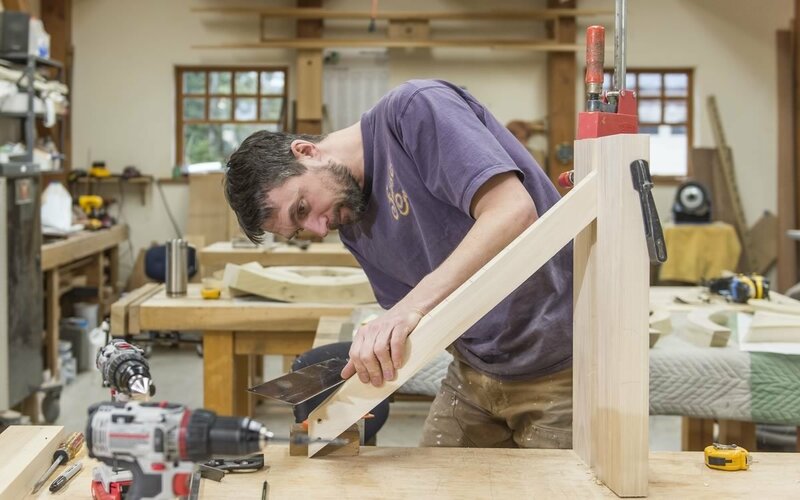 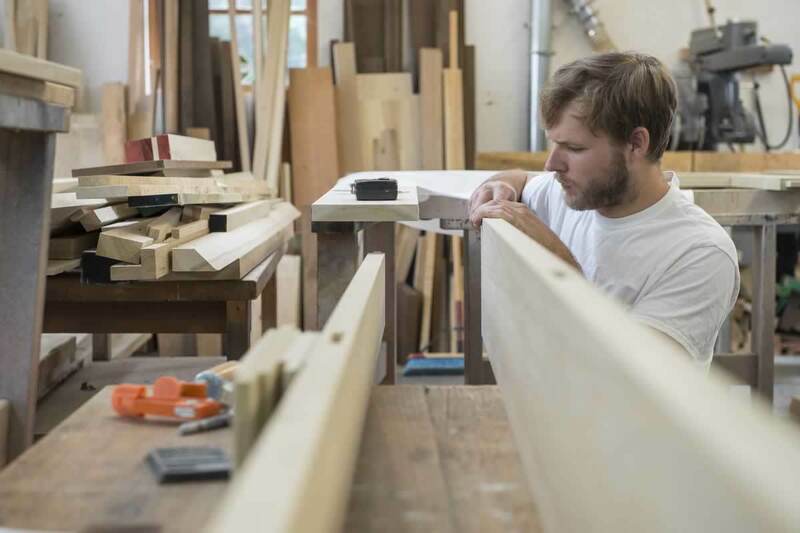 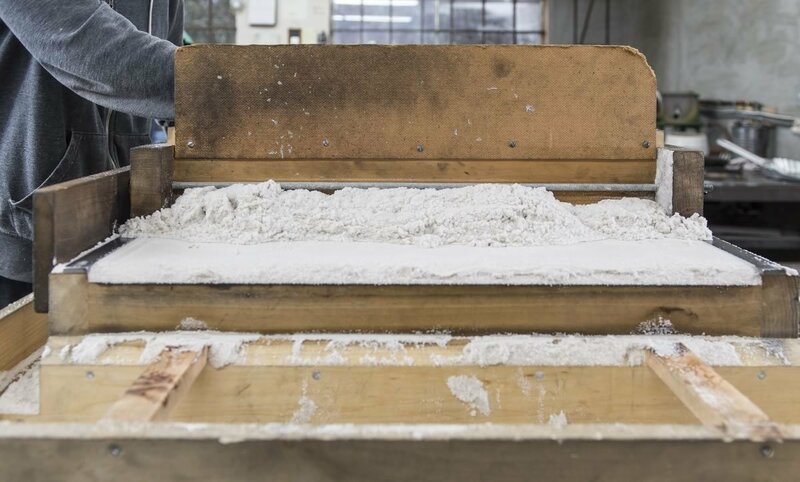 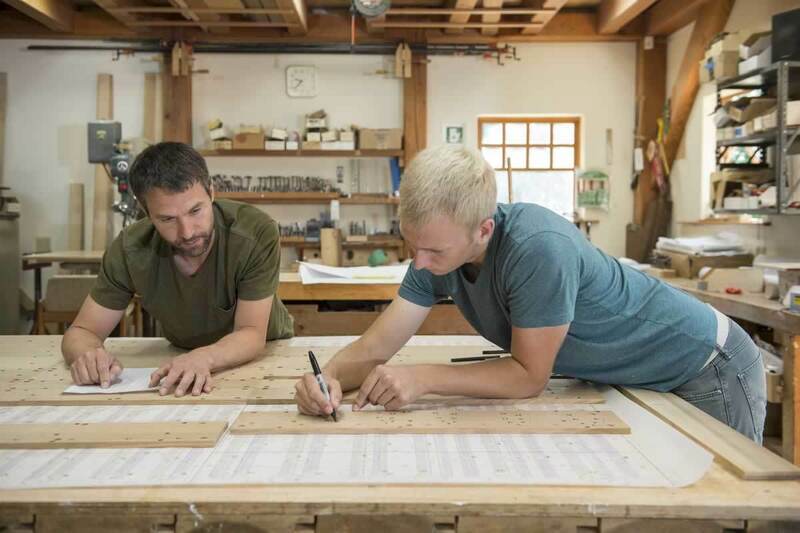 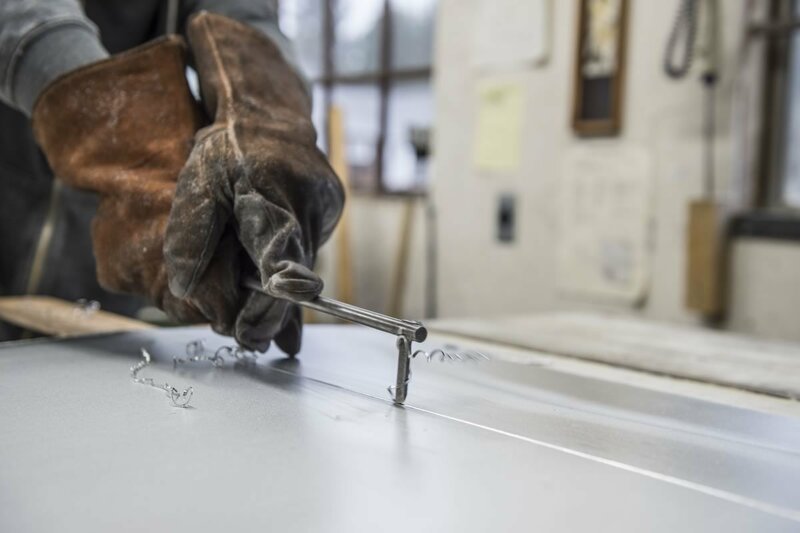 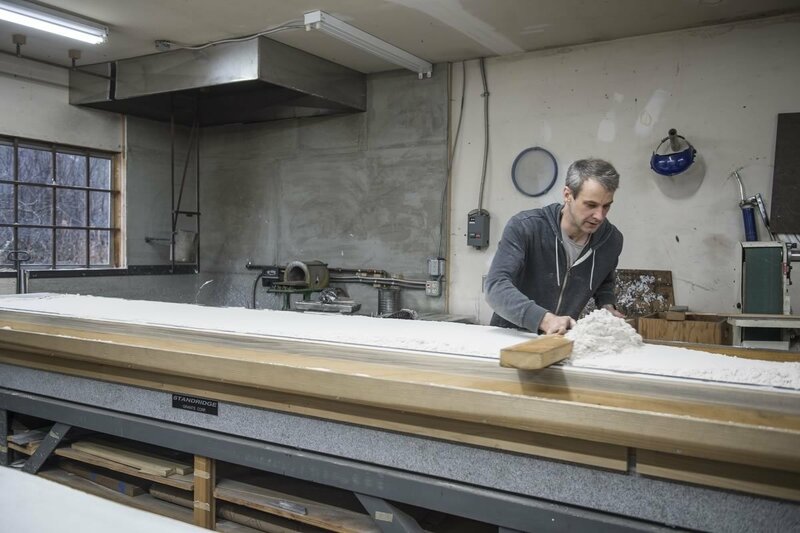 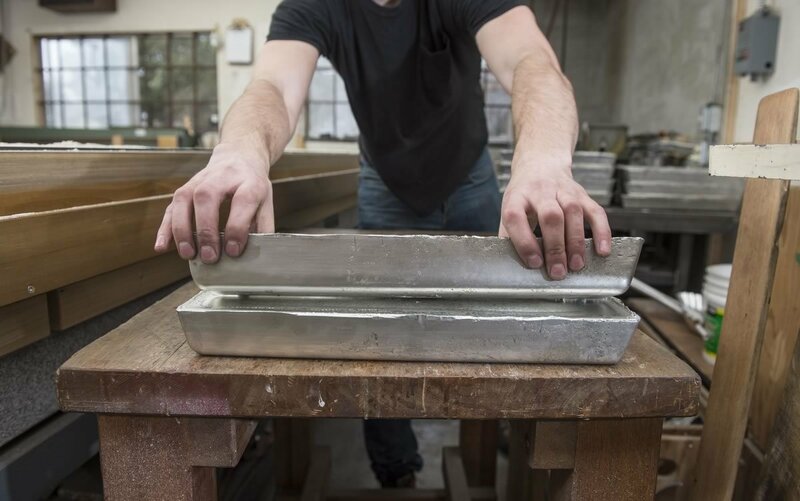 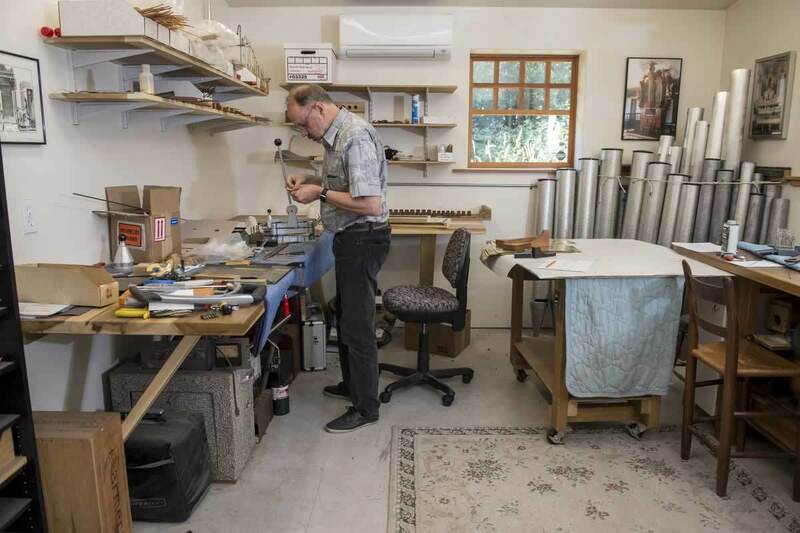 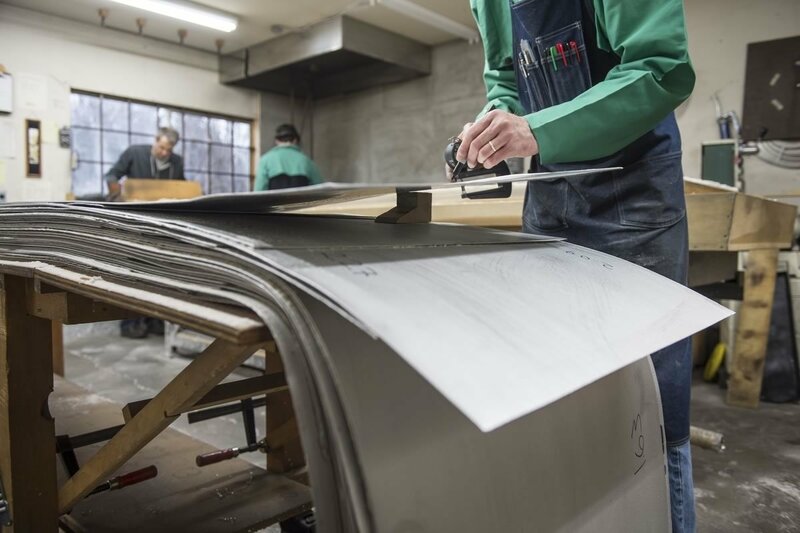 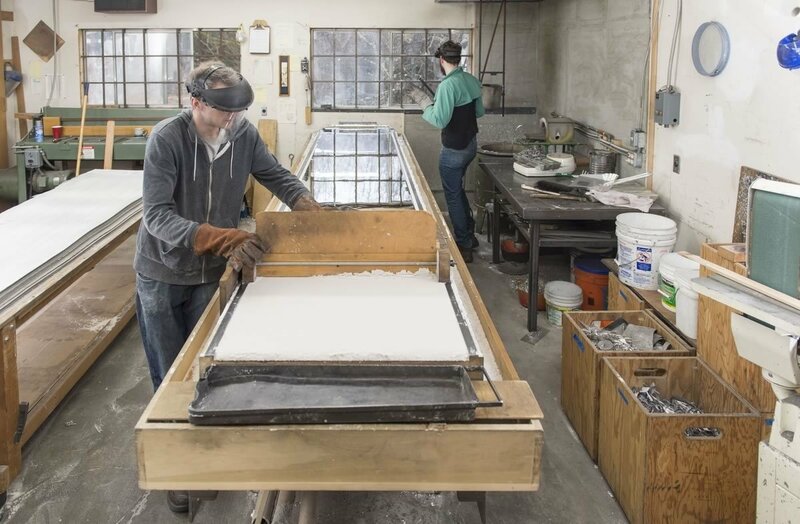 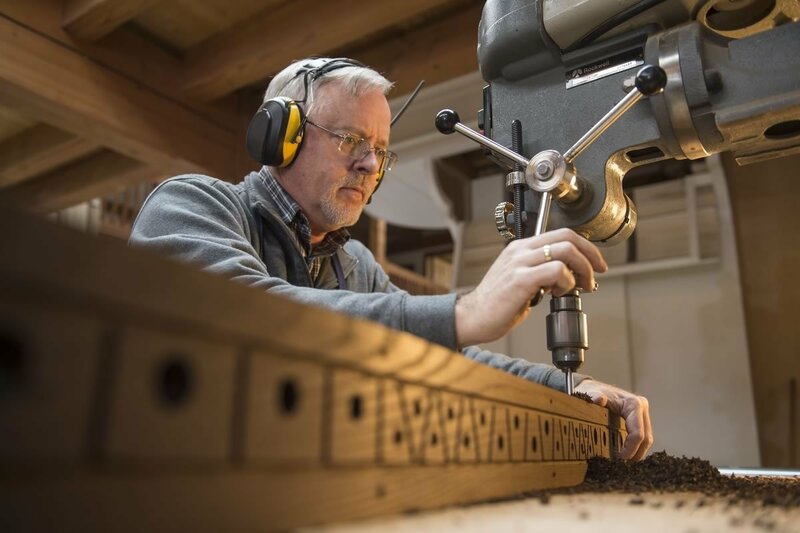 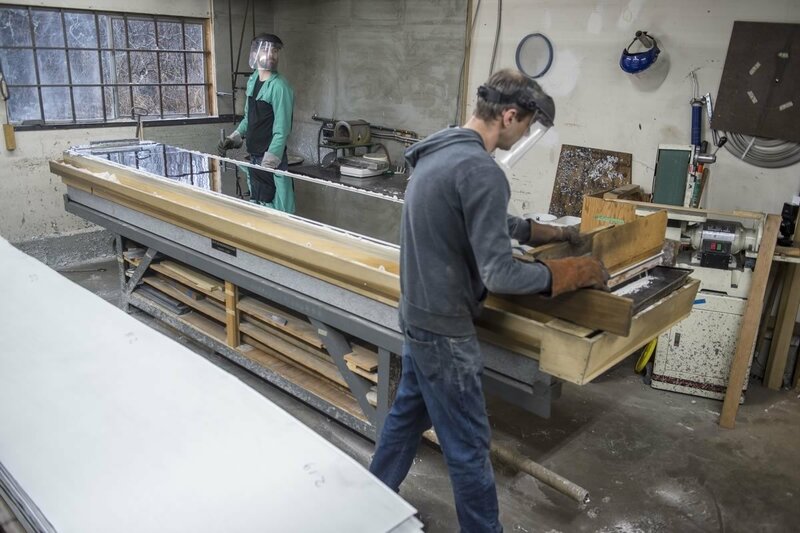 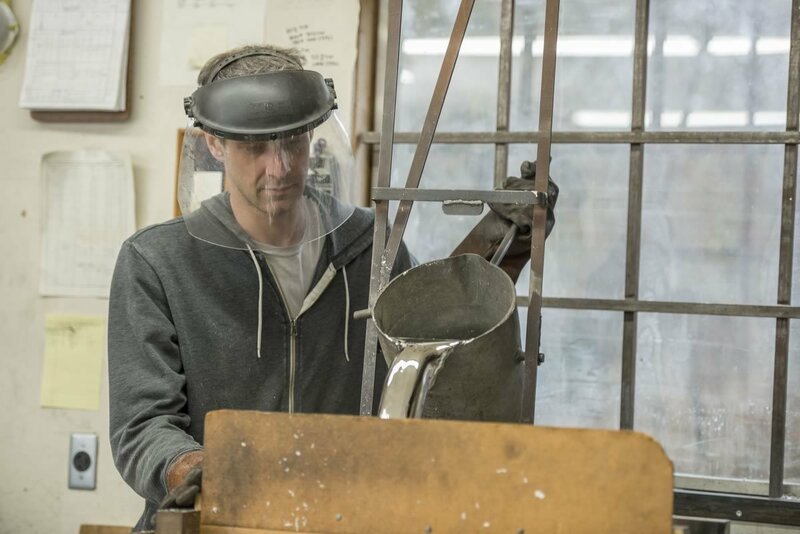 Take a peek inside the Paul Fritts & Company Organbuilders’ workshop. 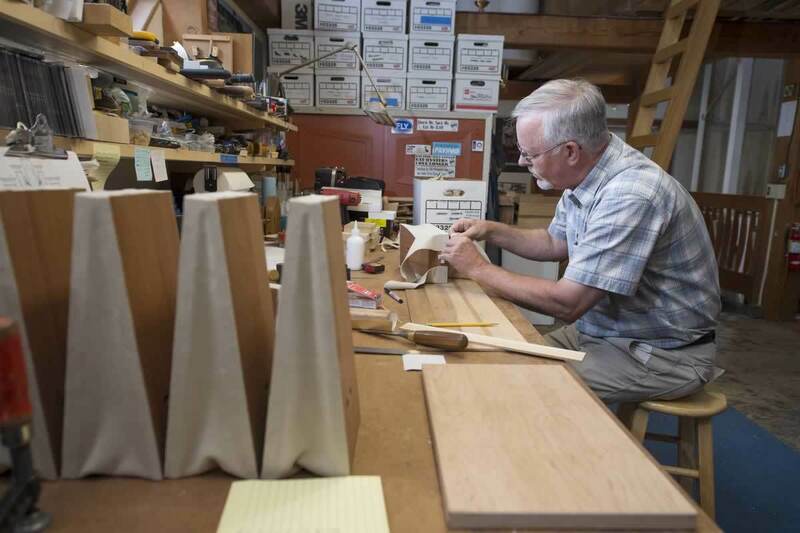 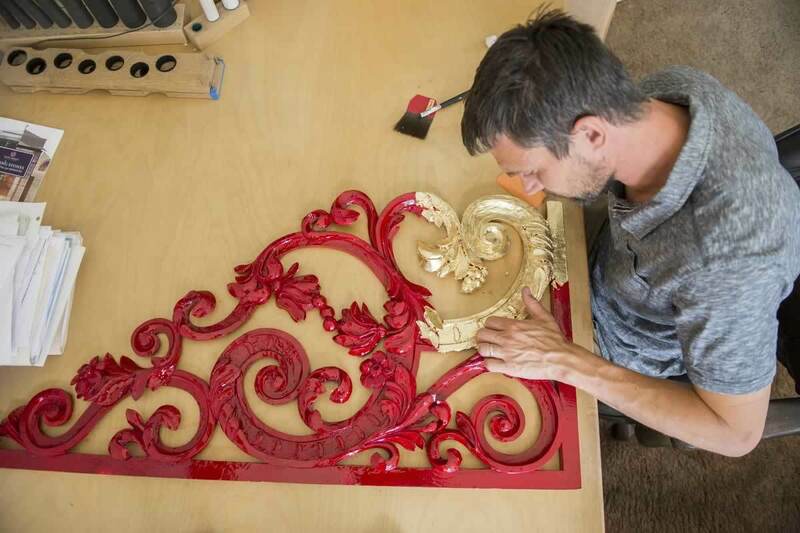 Scenes from the Paul Fritts & Company Organbuilders' workshop. 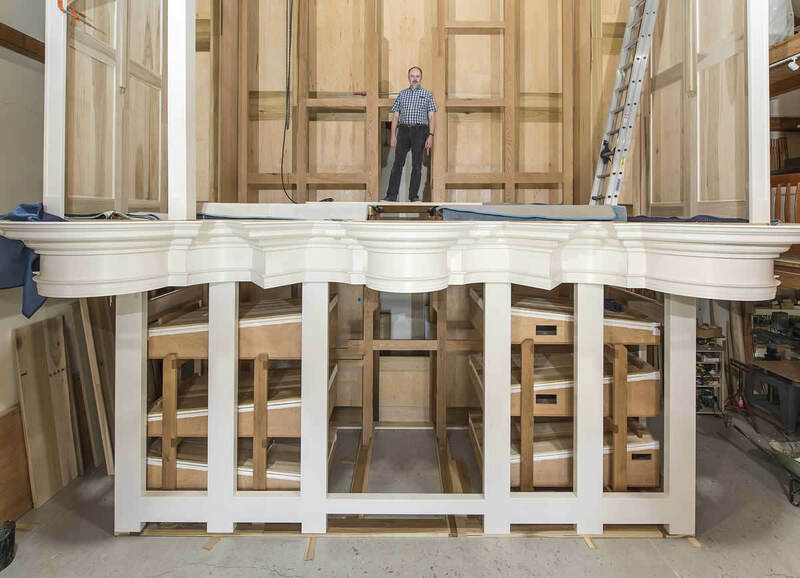 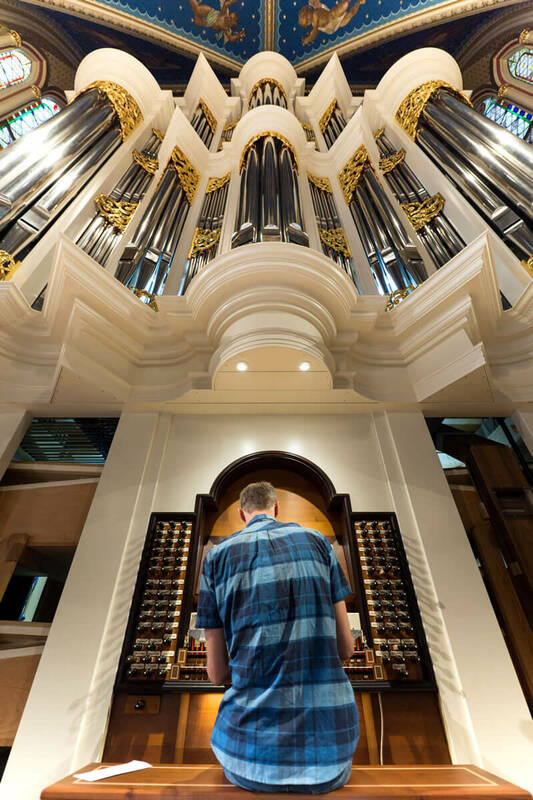 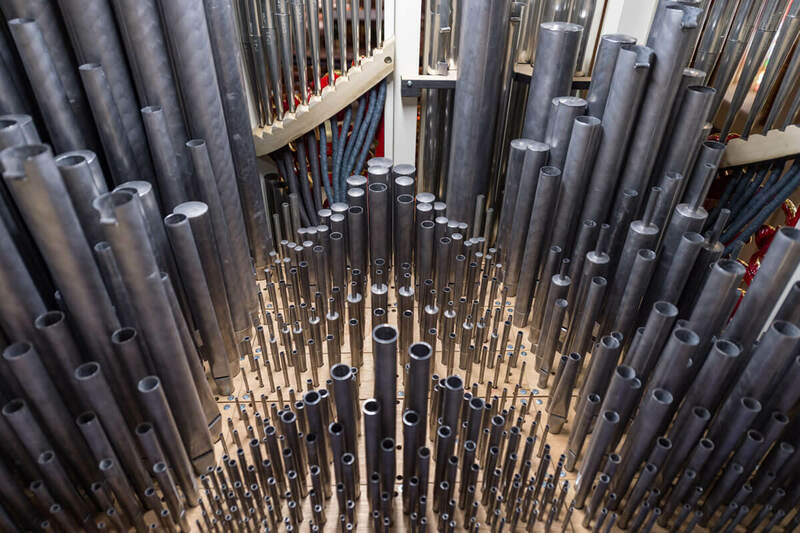 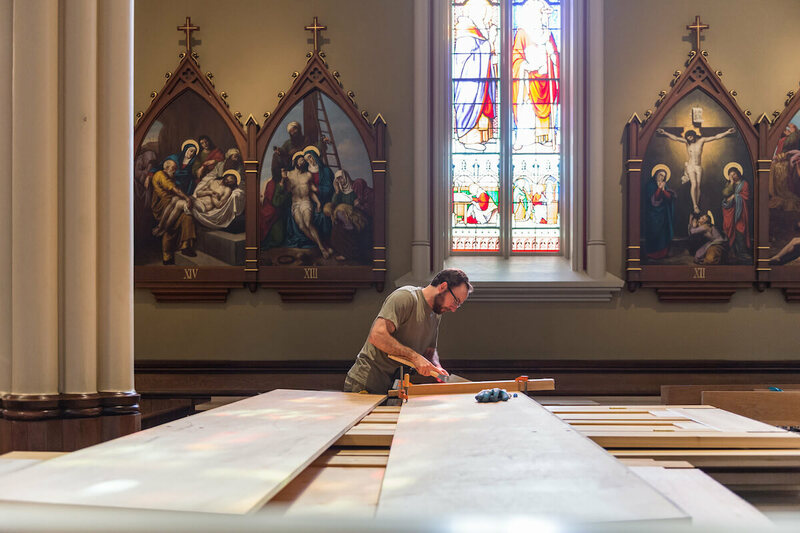 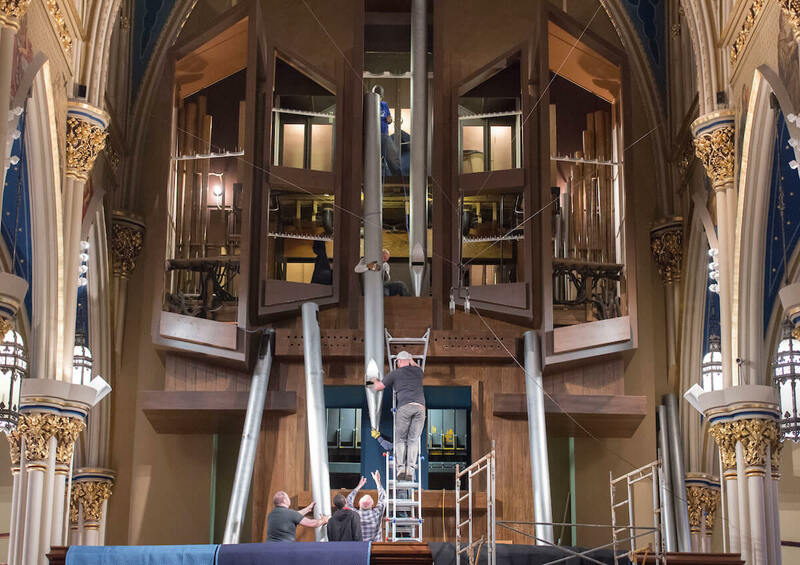 The Murdy will be the fifth pipe organ to accompany worship in Sacred Heart since the 1850s, each one bigger and better than the last as the University has grown and the church itself ascended to international importance. 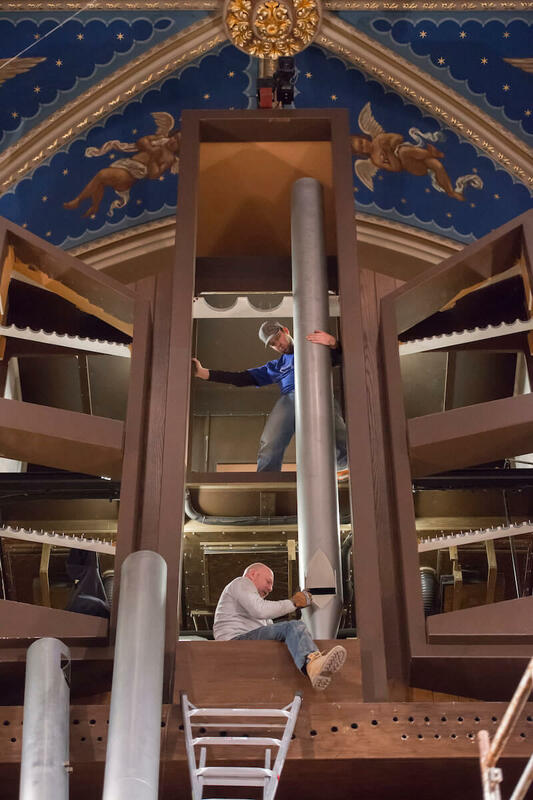 Installing the musical equivalent of a four-story building in the loft of a 145-year-old church takes preparation that touches on everything from structural fortification to acoustics to climate control — not to mention the removal of the Murdy’s beloved and timeworn predecessor, which alone was no small task. 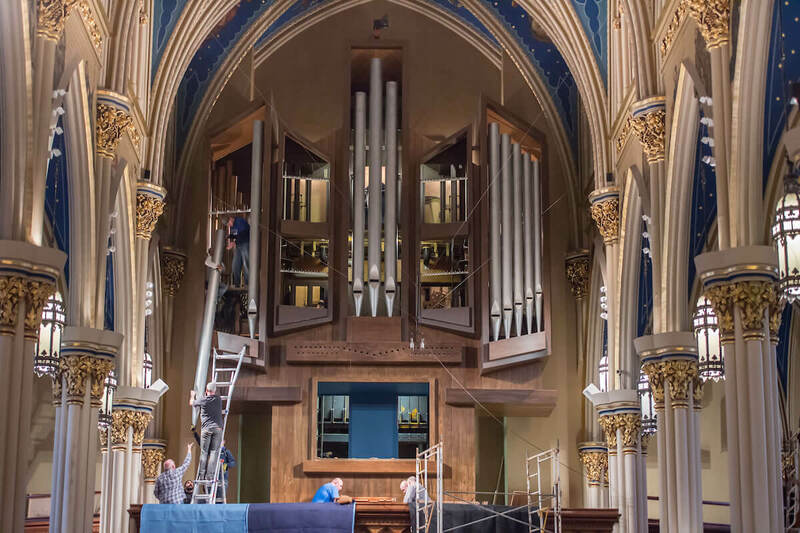 Wondering aloud about what the Basilica and the Murdy Family Organ will look like when it is finally ready to play. 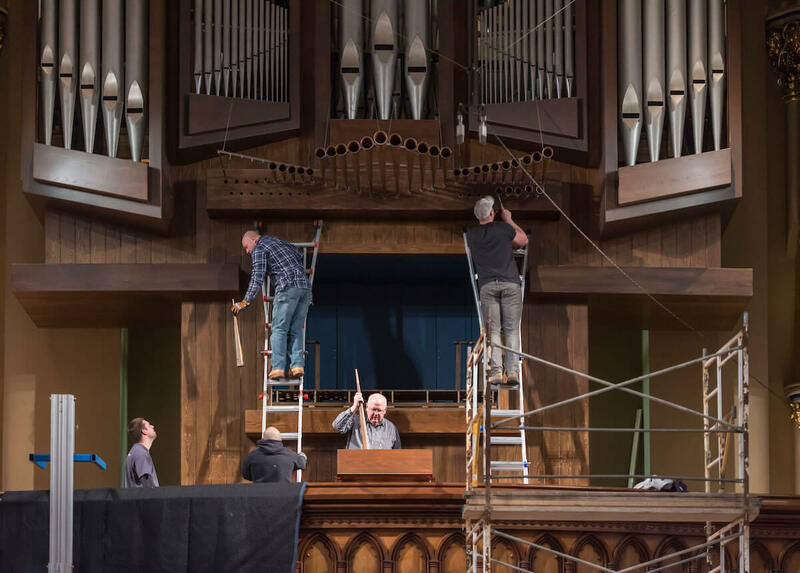 The last performance of the 37-year-old Holtkamp on December 27, 2015. 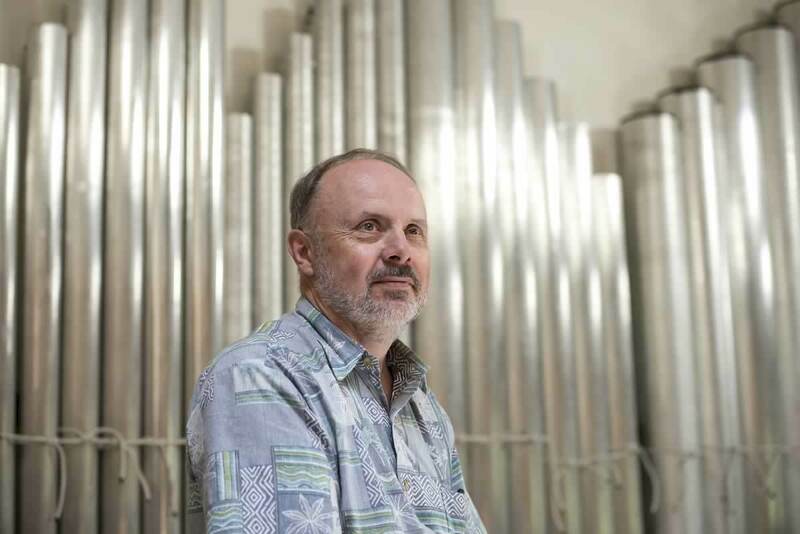 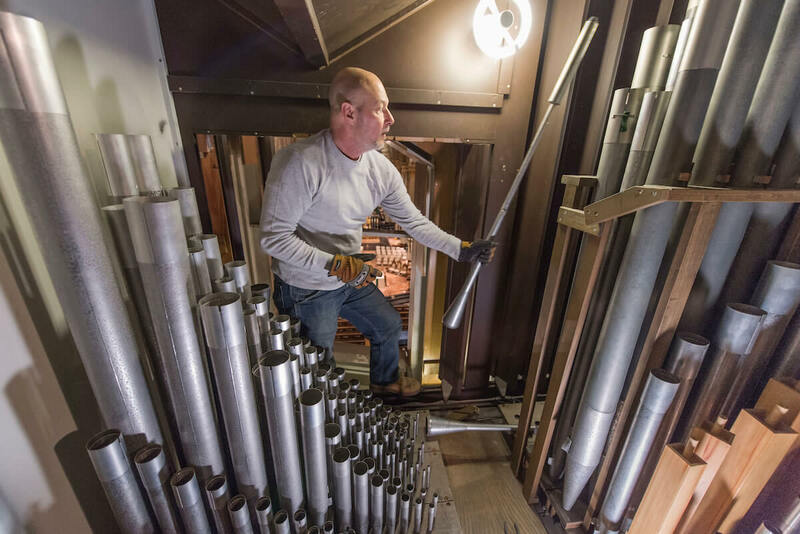 A report on the removal and fate of the Holtkamp Organ. 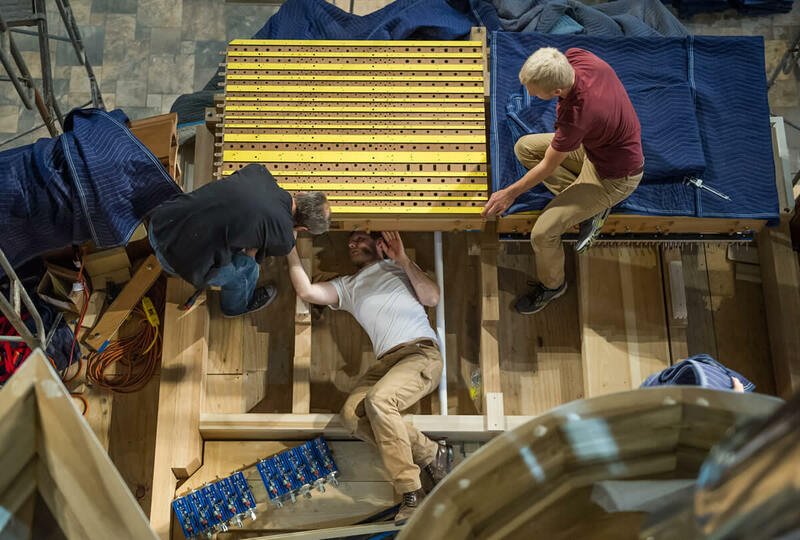 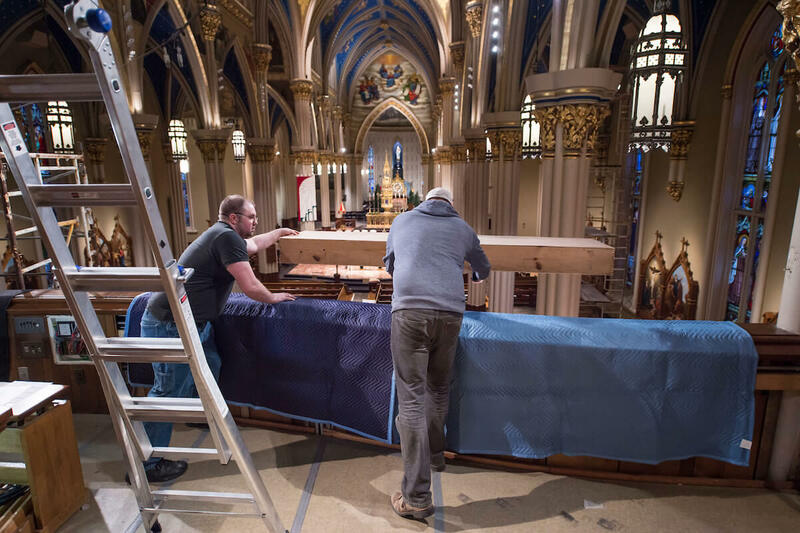 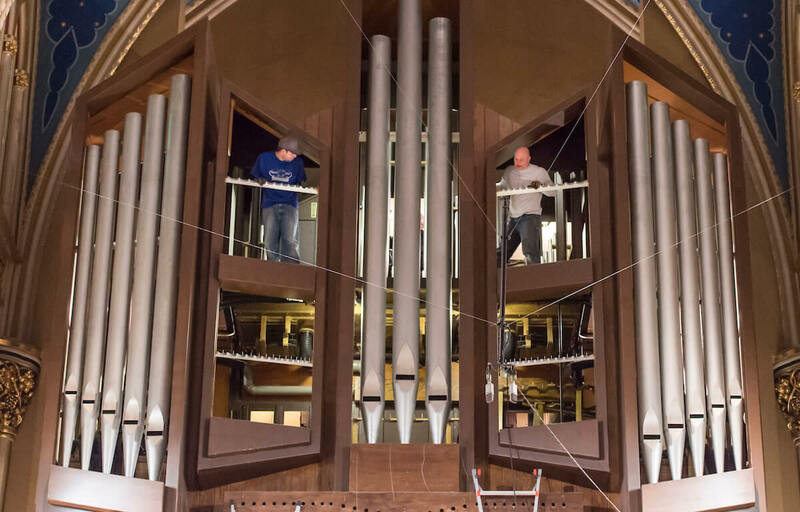 Why Notre Dame is replacing the Holtkamp Organ with a new, unique, mechanical action organ for the Basilica of the Sacred Heart. 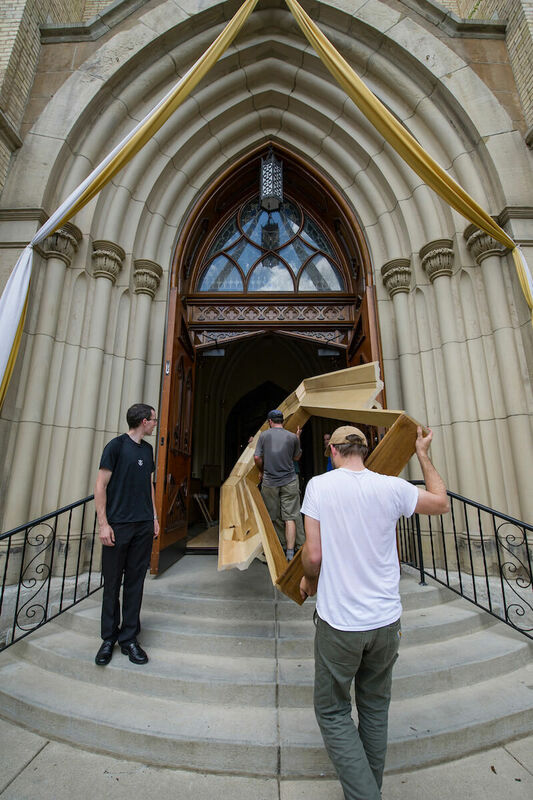 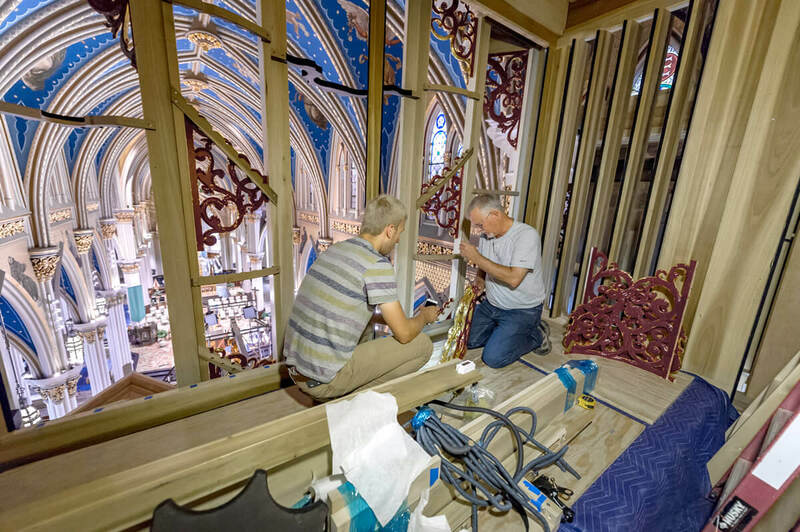 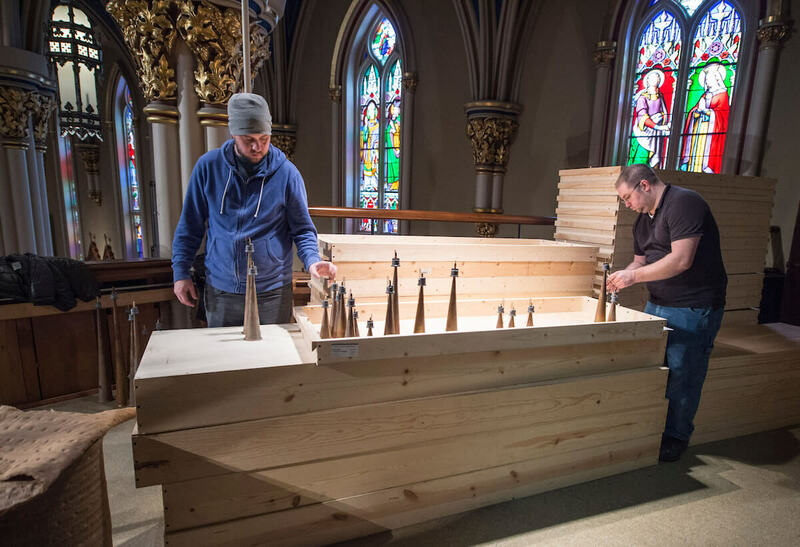 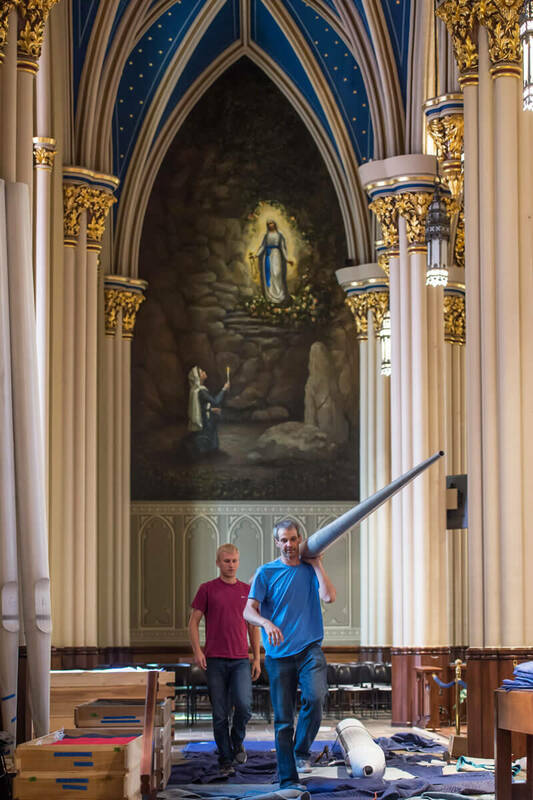 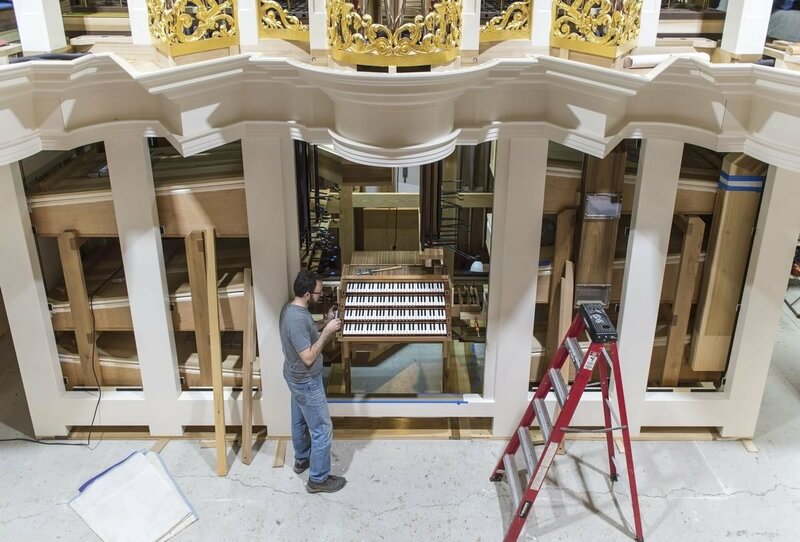 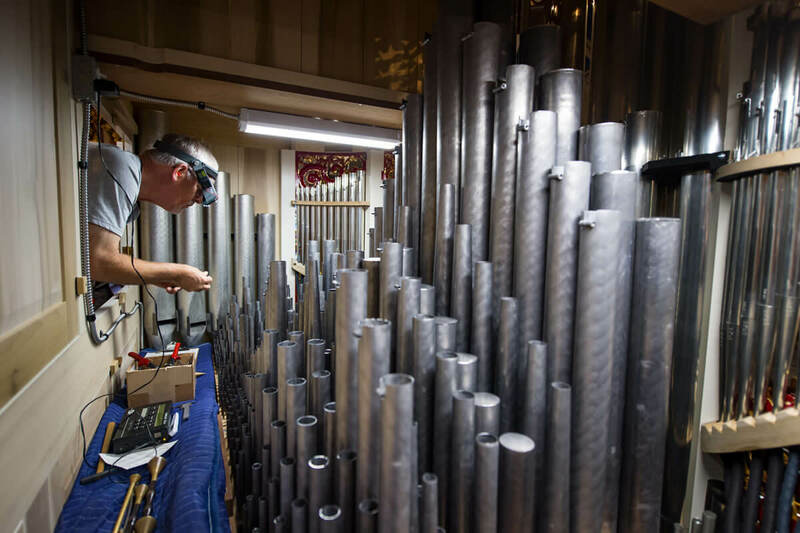 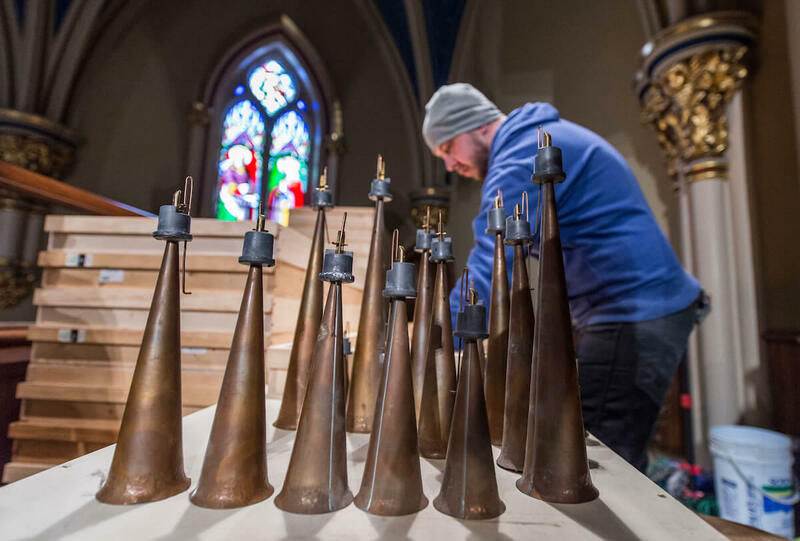 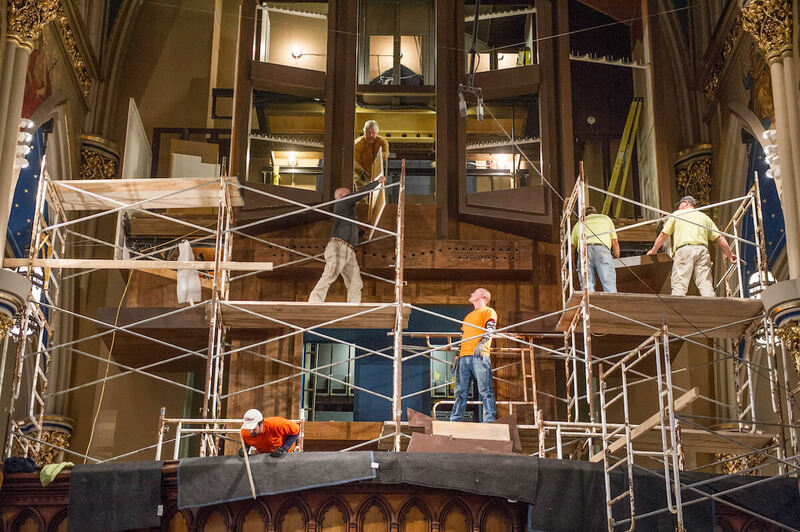 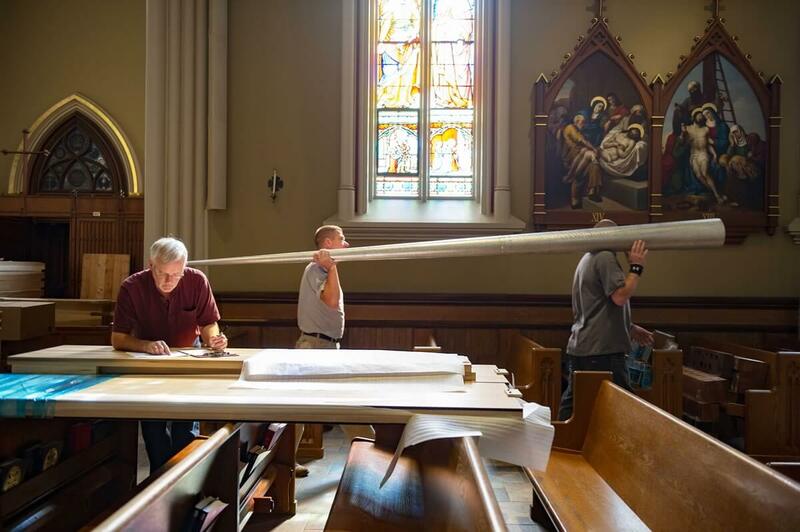 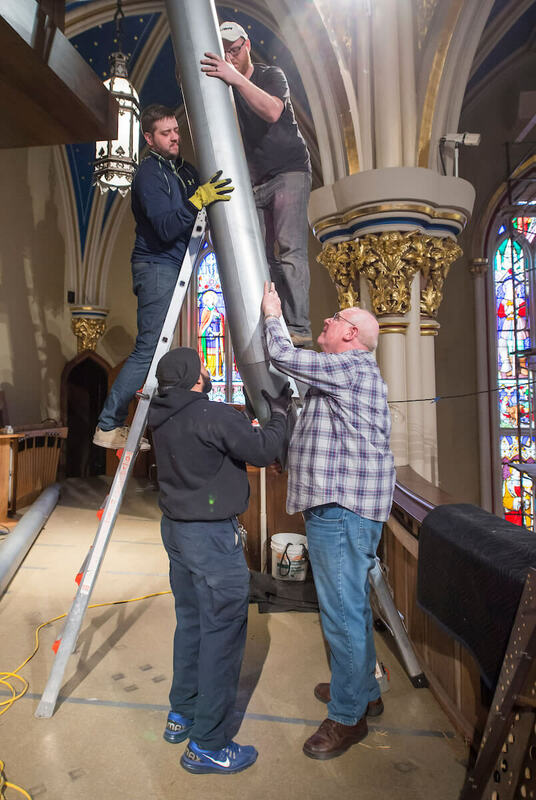 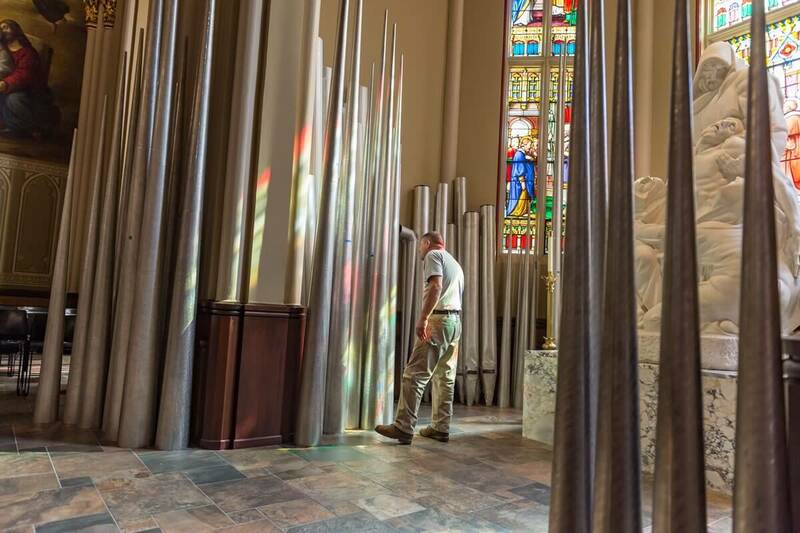 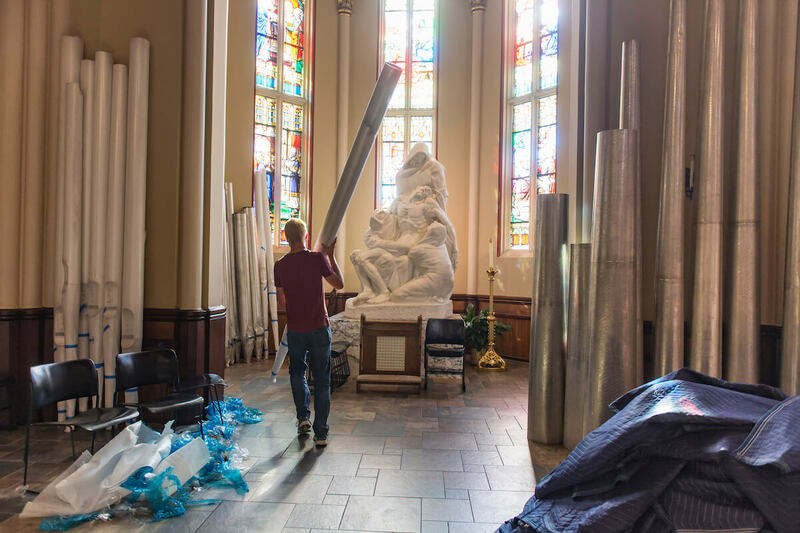 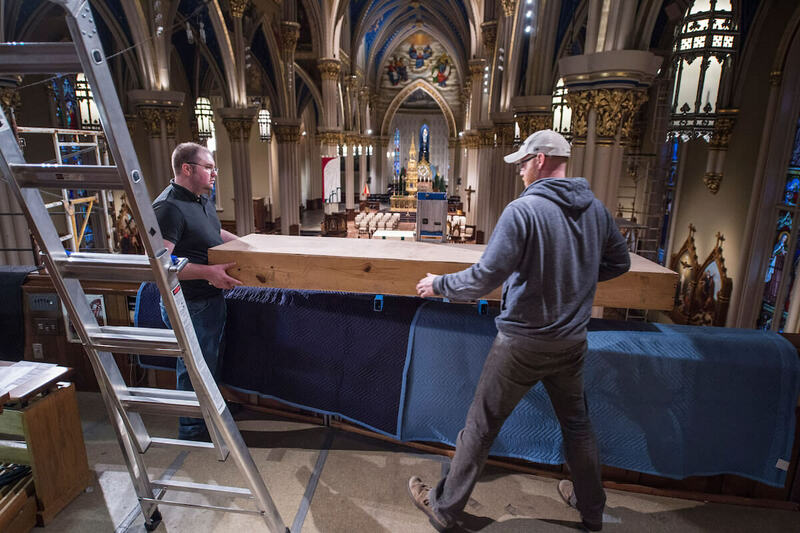 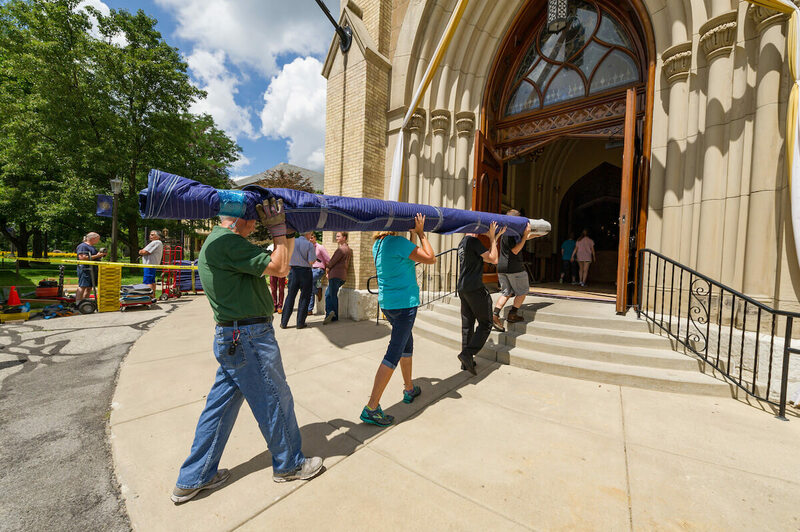 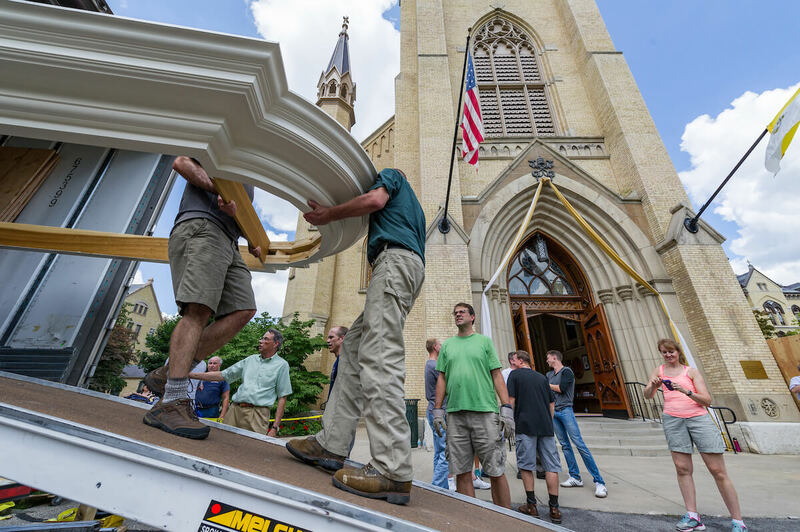 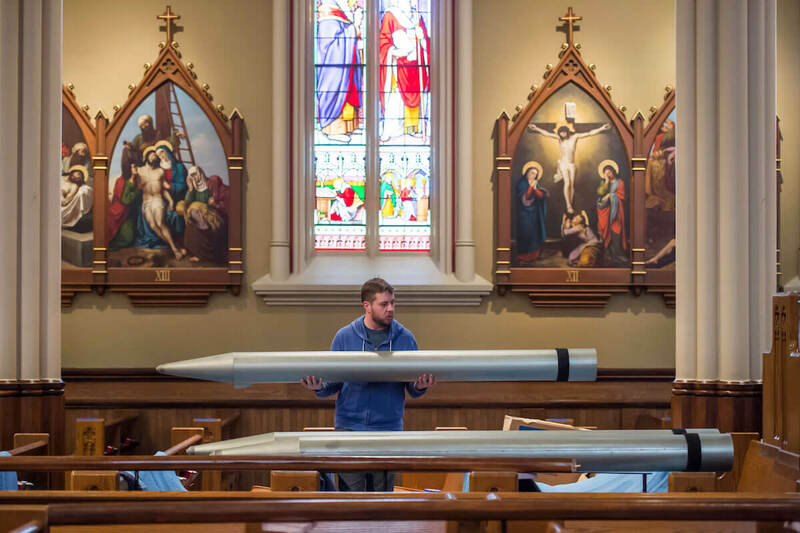 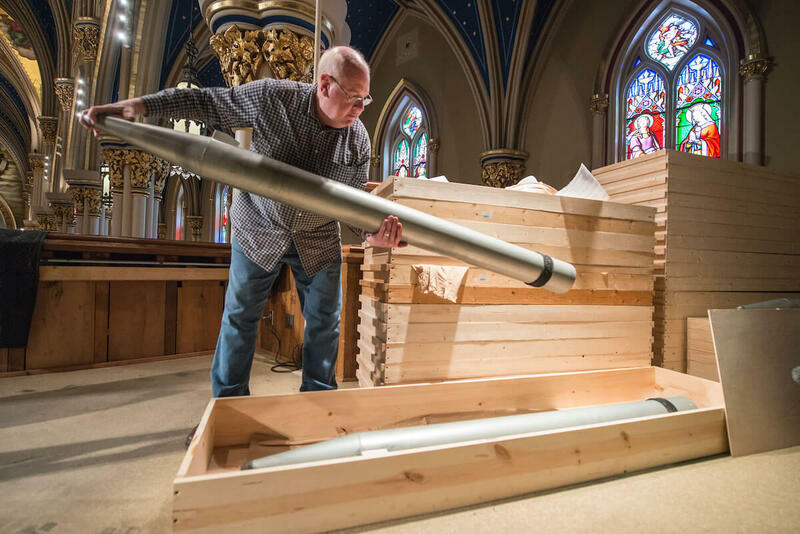 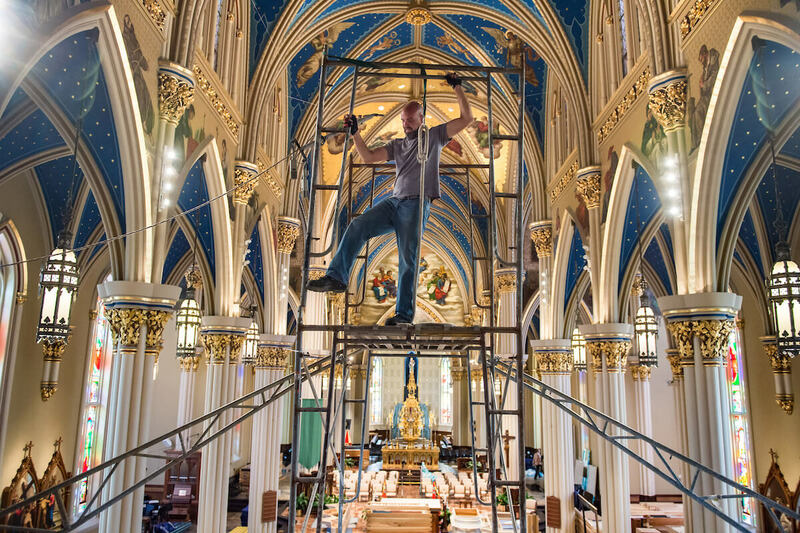 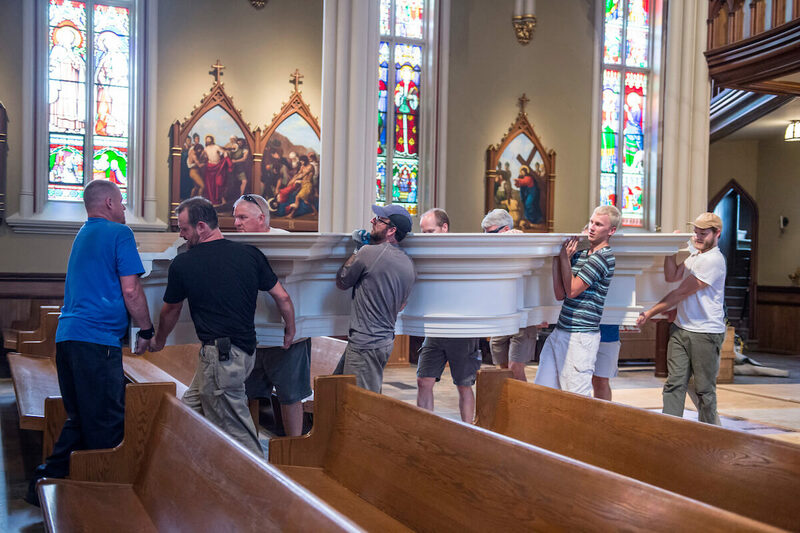 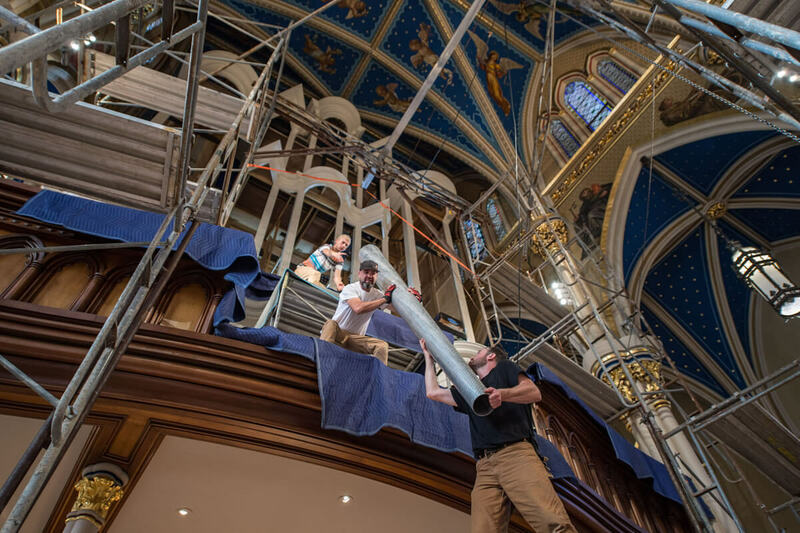 Fritts & Co. arrived on July 31 to unload the trucks and gave themselves until Christmas 2016 to reassemble their delicate giant piece by piece, to tune each pipe and to voice the whole to fit the basilica’s unique acoustical environment. 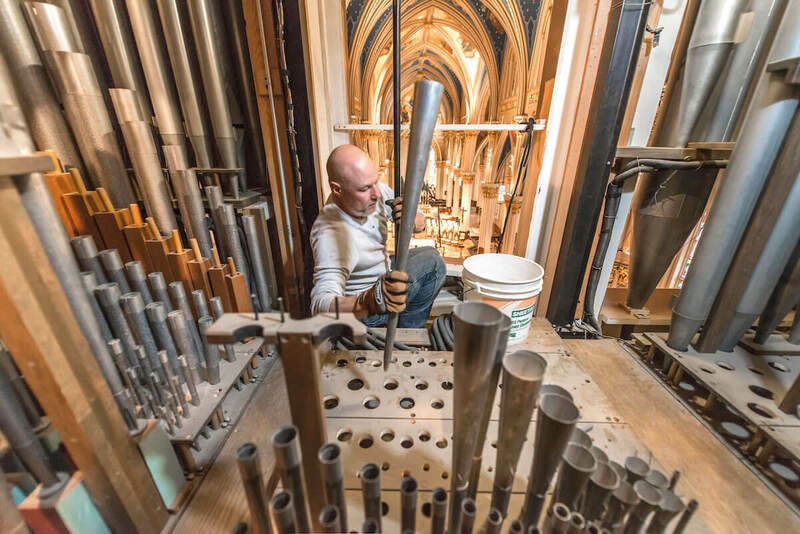 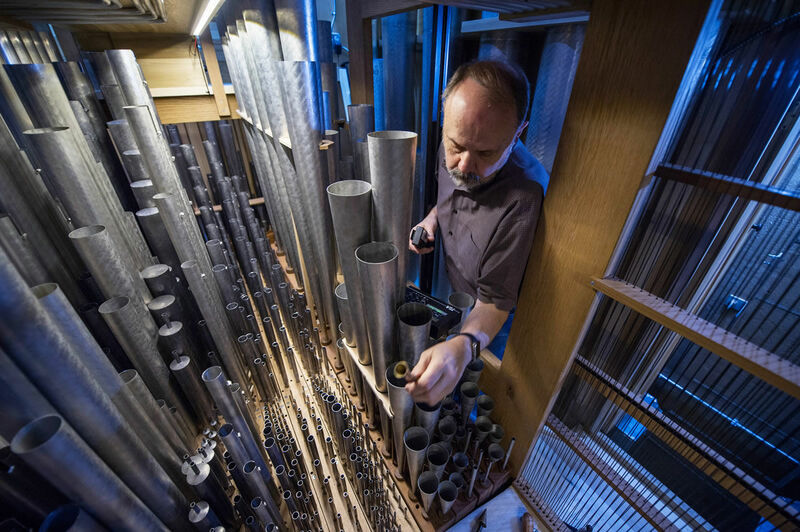 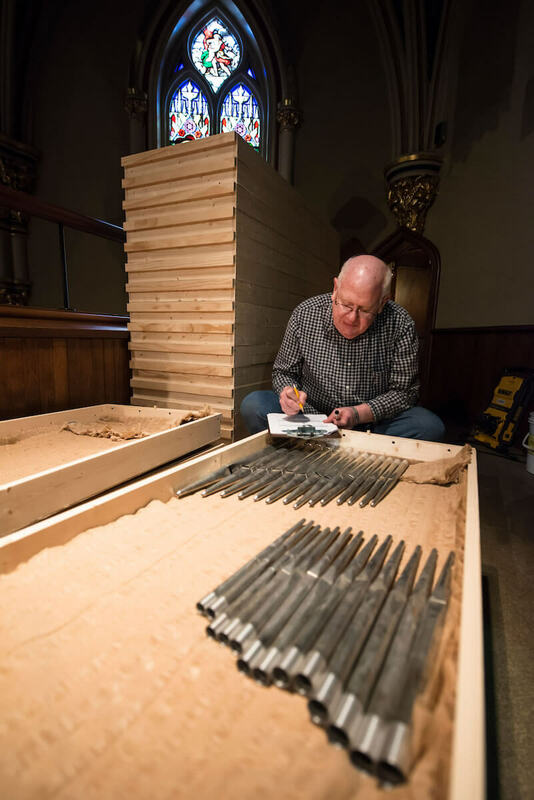 Working long hours, putting their tools away during Sunday liturgies, daily Masses and weekend weddings, the voicers would finish nearly two months ahead of schedule, leaving plenty of time for thanksgivings and — for Notre Dame organists — the task of learning anew from this original instrument and exploring its limitless possibilities. 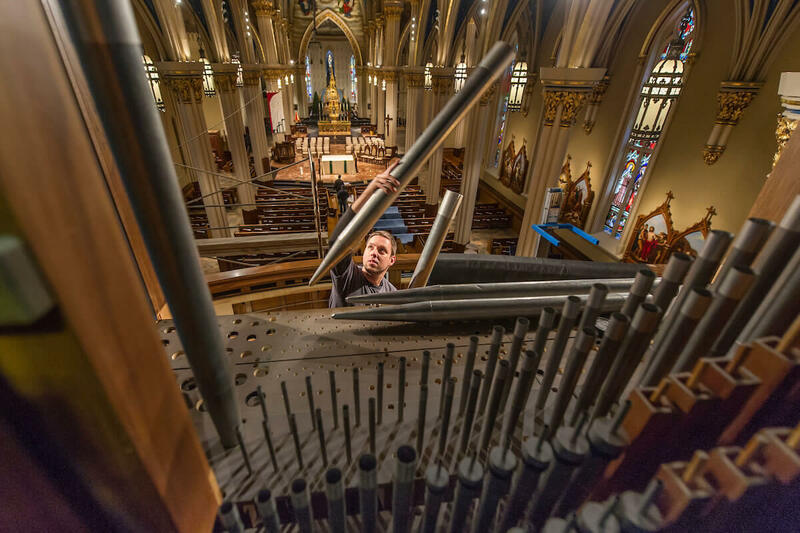 Organ committee member Rudy Reyes Jr. '03MTS, '07M.A. 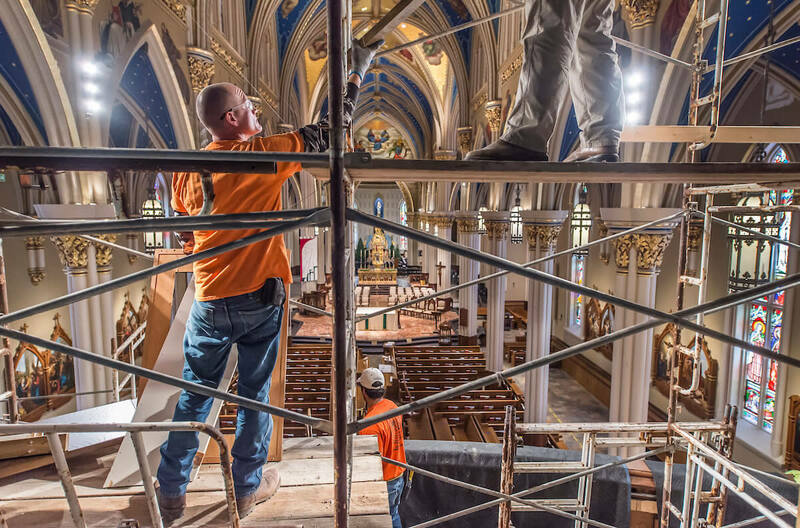 anticipating the completion of work on the Murdy. 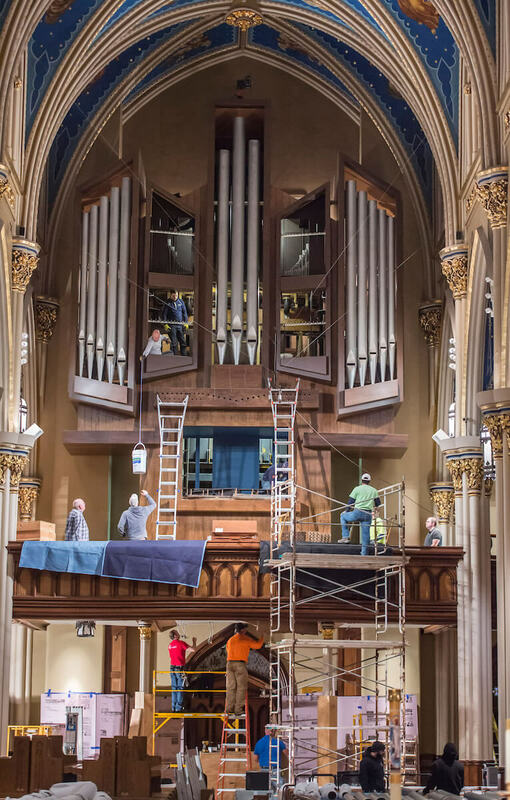 Time-lapse documenting the move-in and installation construction of the organ in August 2016. 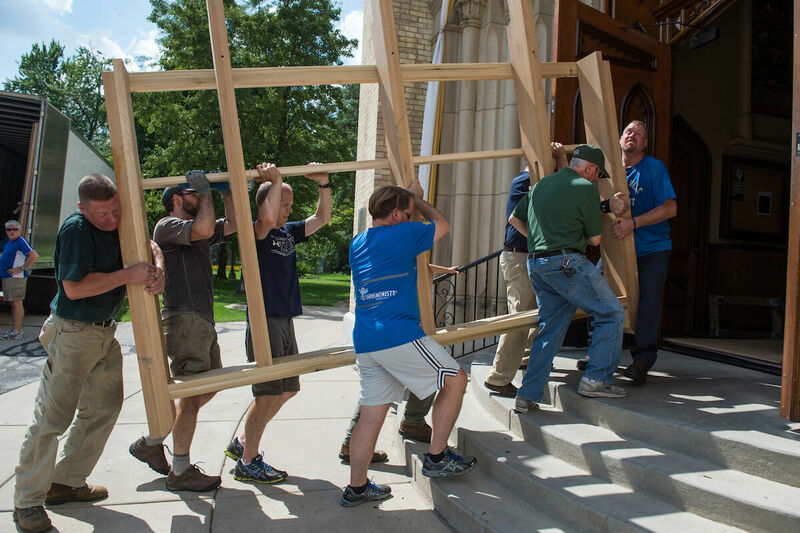 A behind-the-scenes report on move-in day, July 31, 2016. 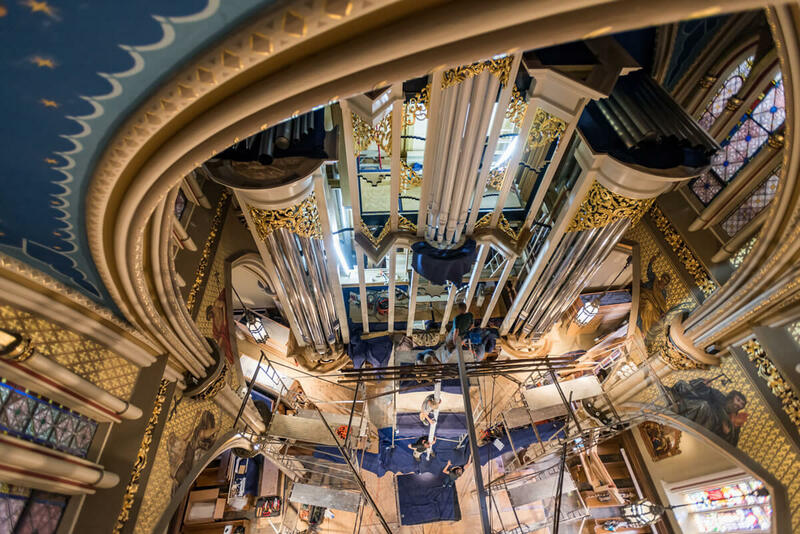 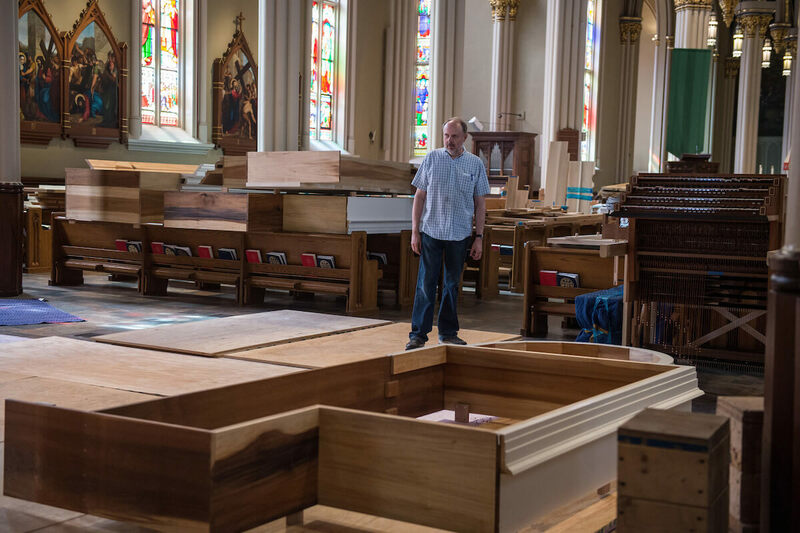 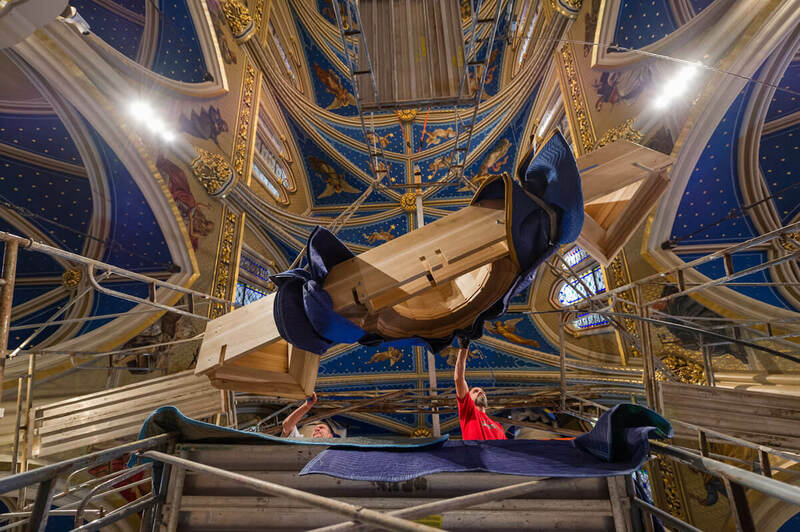 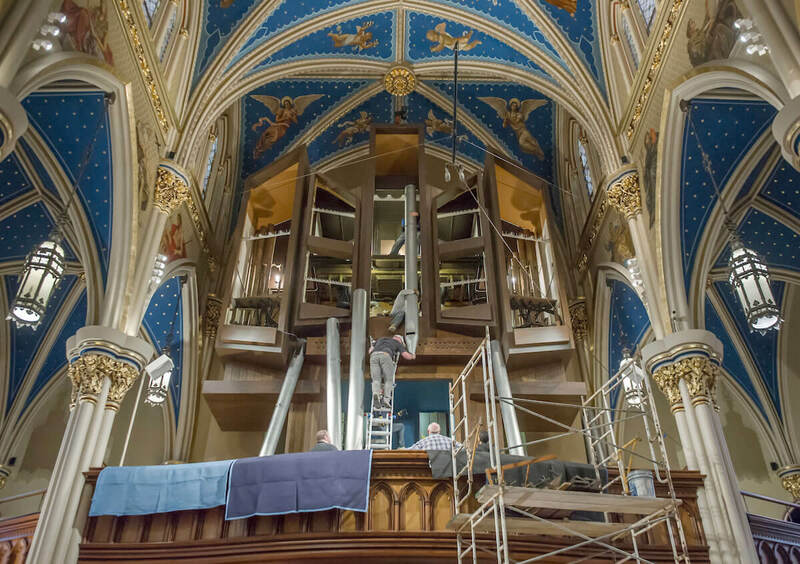 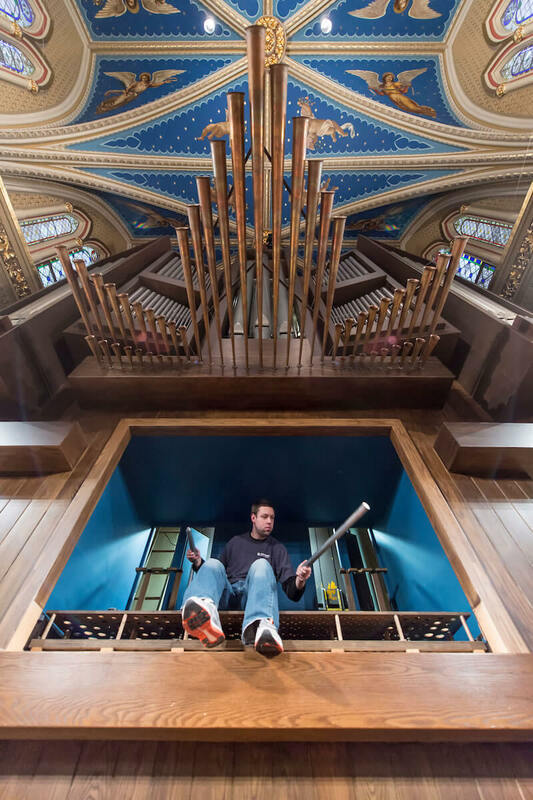 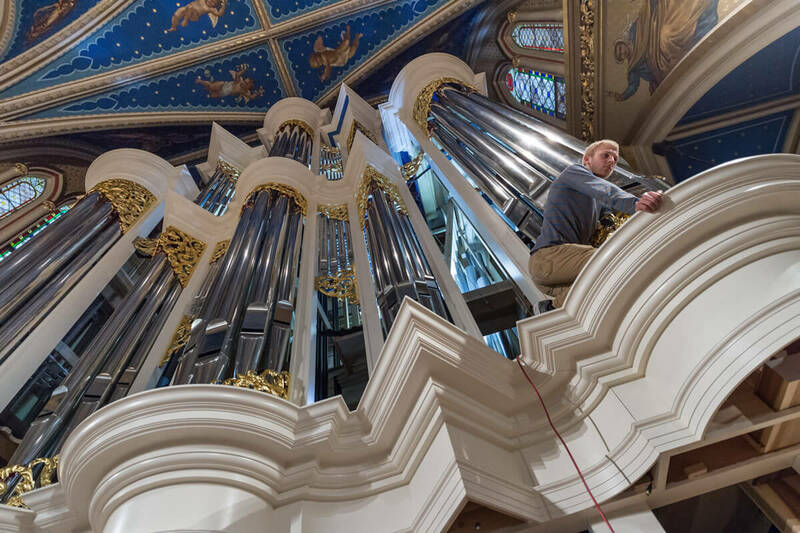 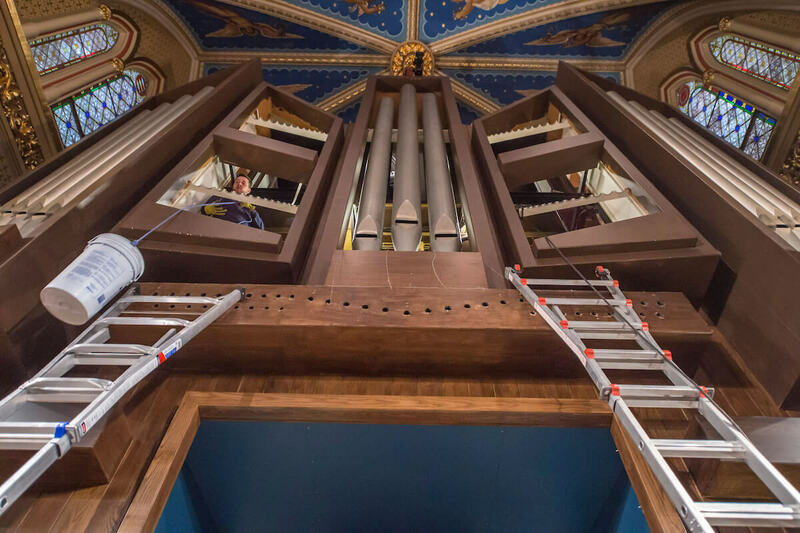 The Murdy Family Organ, a grand creation from the renowned Fritts workshop, is installed in the Basilica of the Sacred Heart. 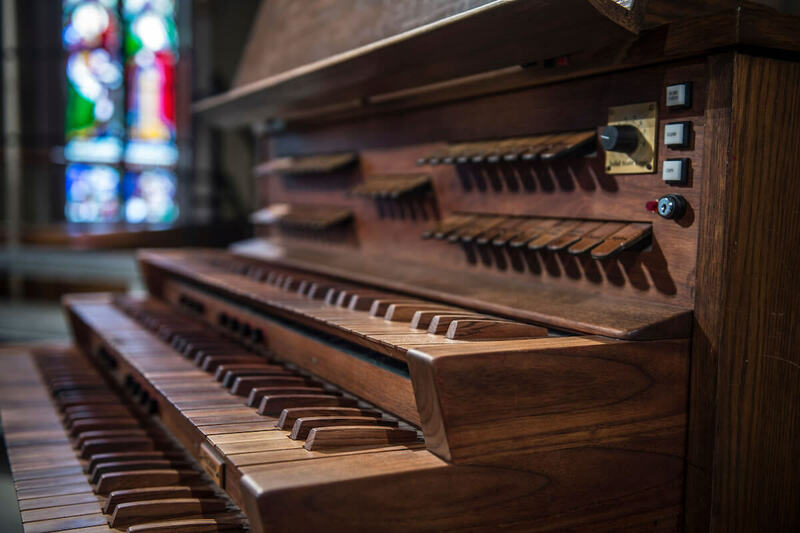 In the end, what matters most is the music, the hearts held aloft in prayer, the spirit’s chance to contemplate, to sorrow, to soar. 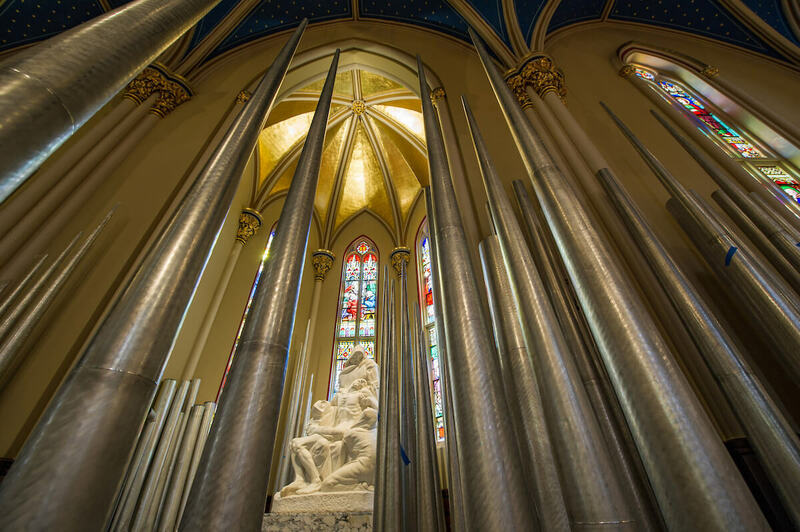 Most basilica visitors will experience the Murdy during rites of prayer and worship — congregational hymns, psalms and sequences, choral meditations and the majestic preludes and postludes that signal the beginning and end of an hour of sacred, communal time. 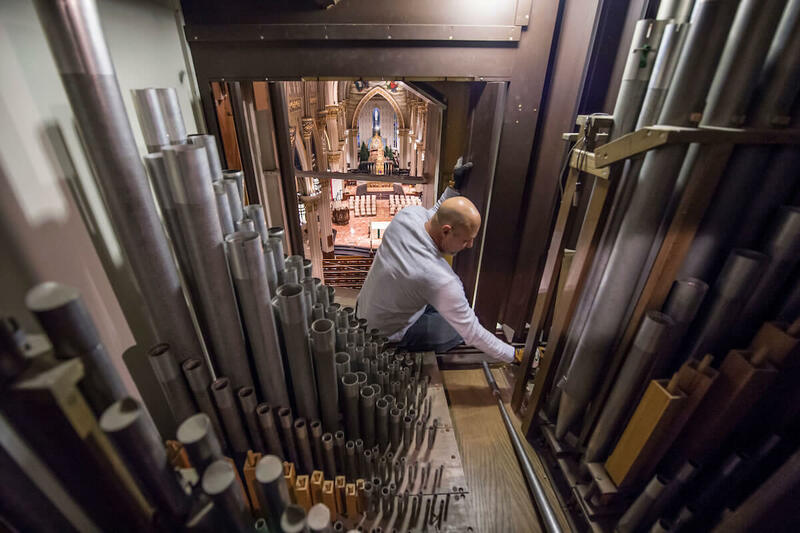 For the professionals who will play it, and the students in Notre Dame’s increasingly competitive undergraduate and graduate organ programs, the Murdy will play the additional role of teacher. 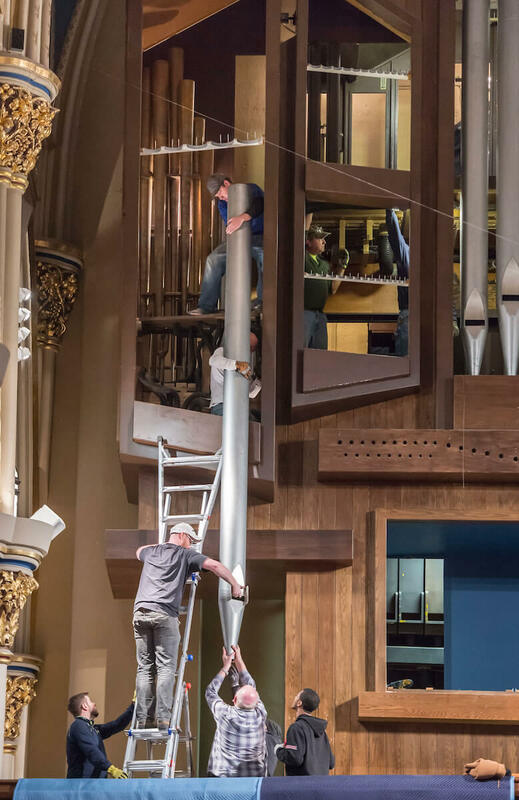 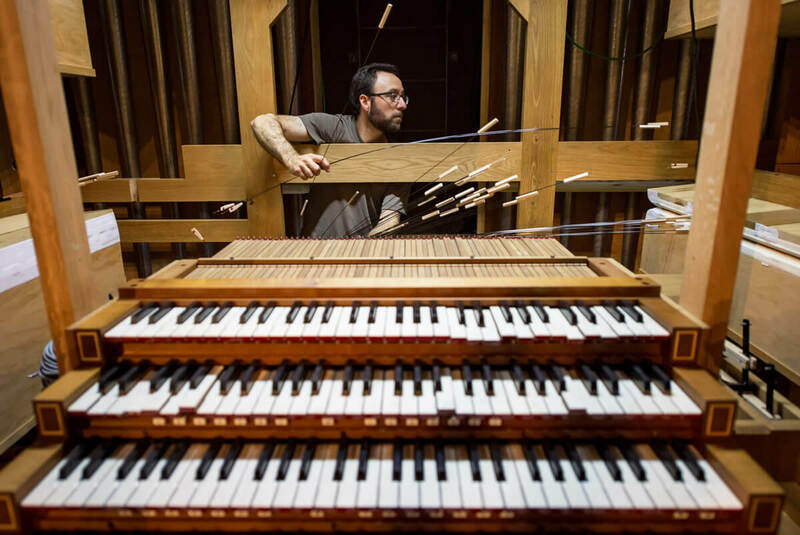 Between Notre Dame’s two grand organs in the basilica and the DeBartolo Performing Arts Center, organist Craig Cramer says, students will be able to explore and perform the breadth and depth of the organ literature of the last 400 years. 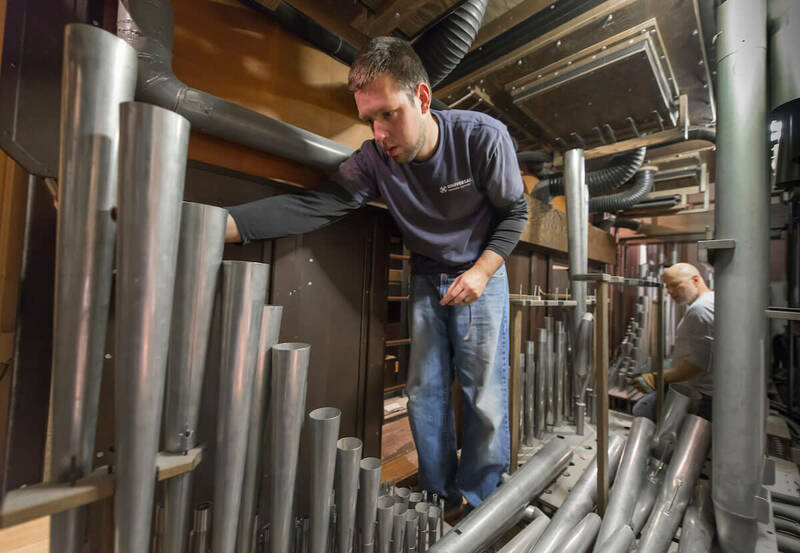 In the professor’s words, the two Fritts organs will be the best teachers these students ever have. 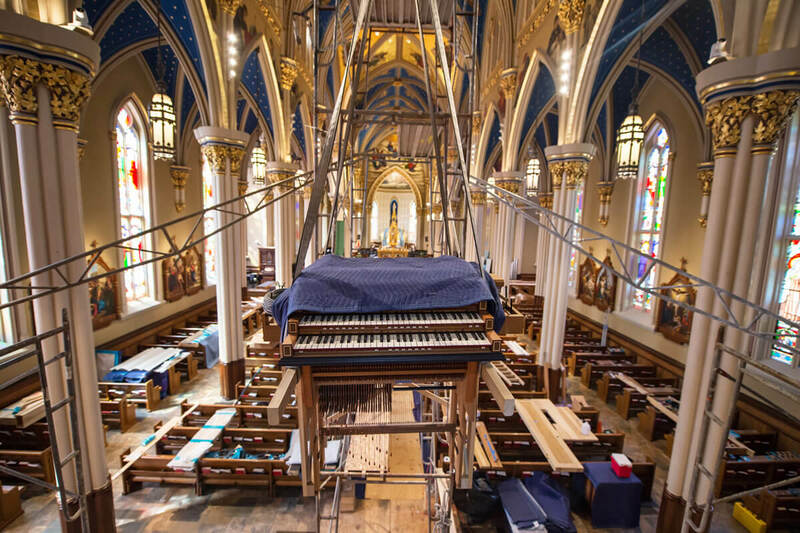 Cramer, professor of organ at Notre Dame since 1981, performs Sei gegrüsset, Jesu gütig (“Be greeted, good Jesus”) composed by J.S. 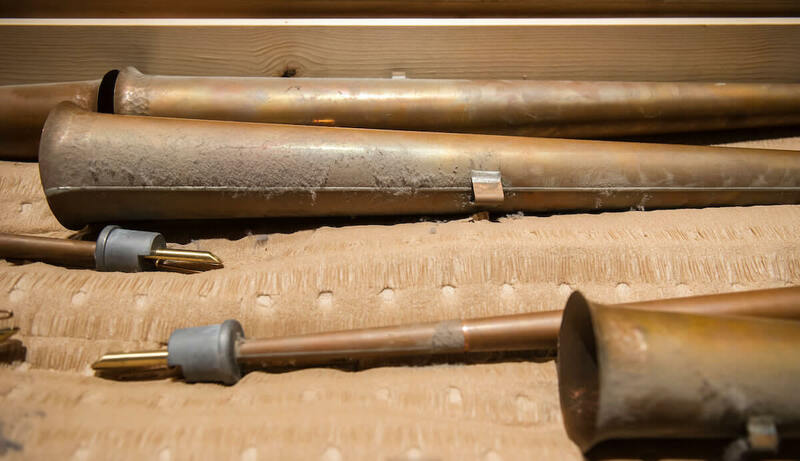 Bach in the early 1700s. 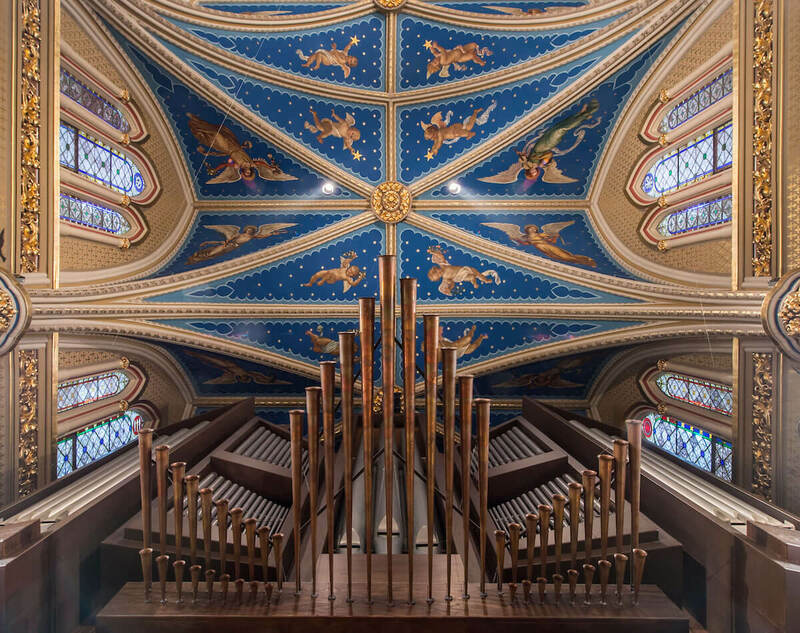 Plagerman, a candidate for the Master of Sacred Music degree in organ performance at Notre Dame, performs the Allegro Maestoso e Vivace from Felix Mendelssohn’s Sonata No. 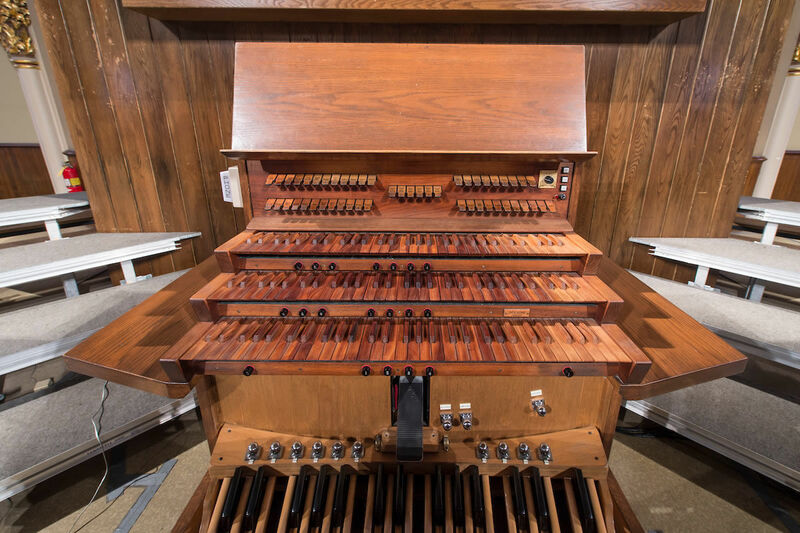 4 in B-flat major (1845), showcasing the instrument’s capacity to handle the later repertoire. 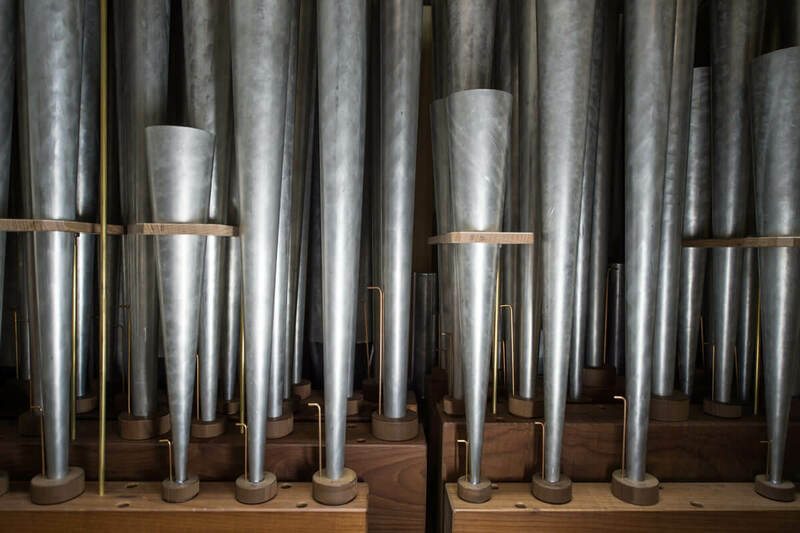 Bone up on your organ knowledge; impress your friends. 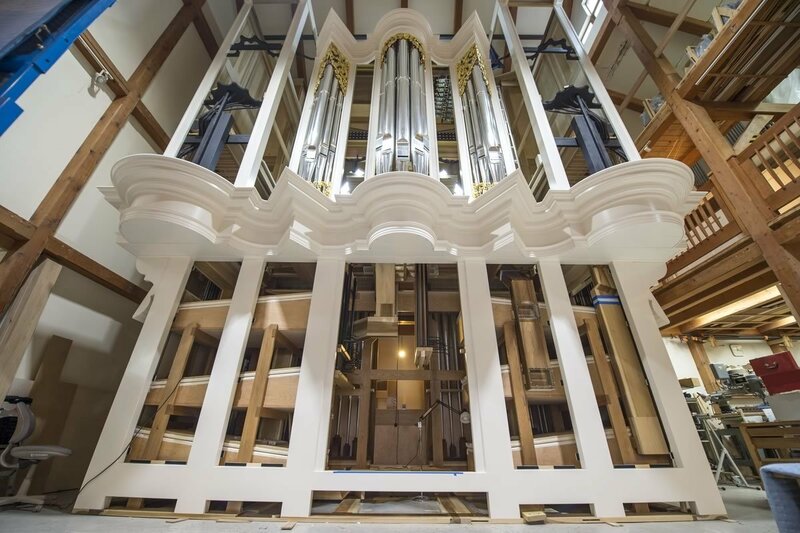 A new organ adds another jewel to the Sacred Music program. 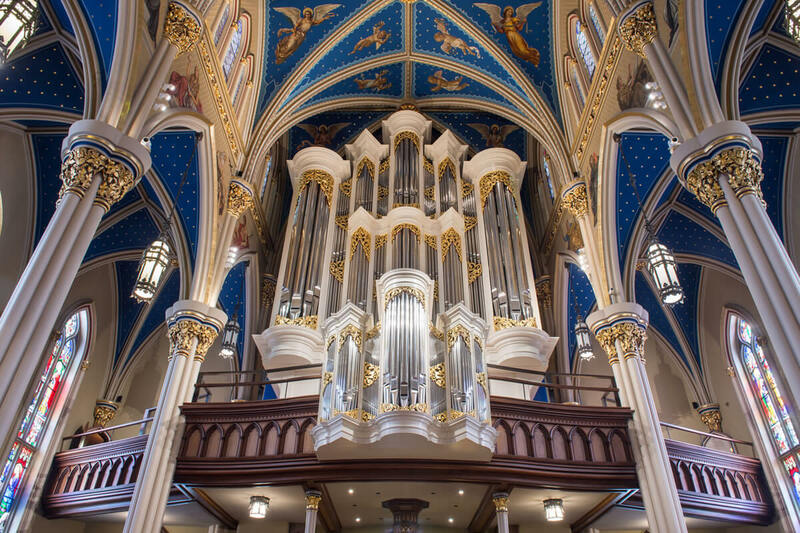 The organ received a Notre Dame welcome on January 20, 2017: hymns, readings, an episcopal blessing and an inaugural concert performed by Professor Cramer.